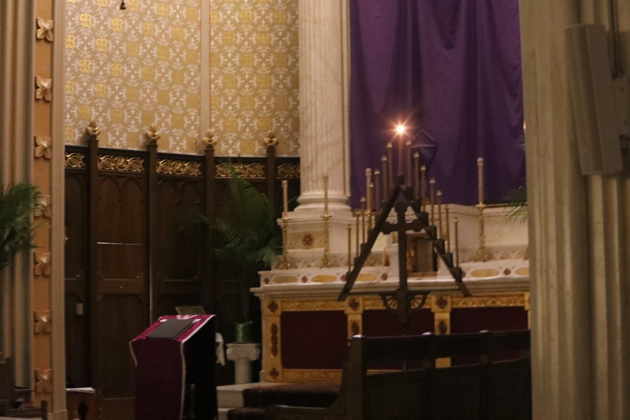 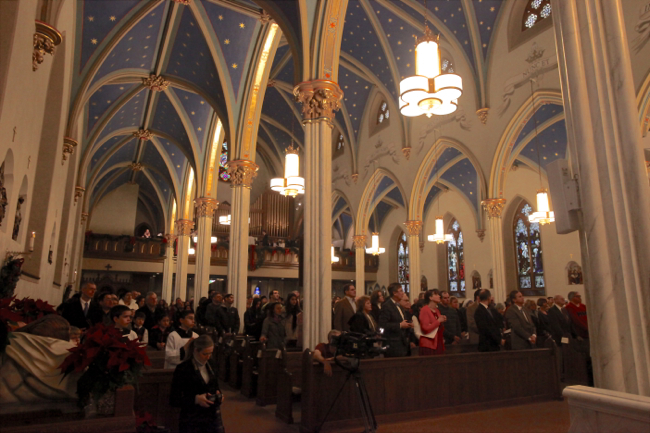 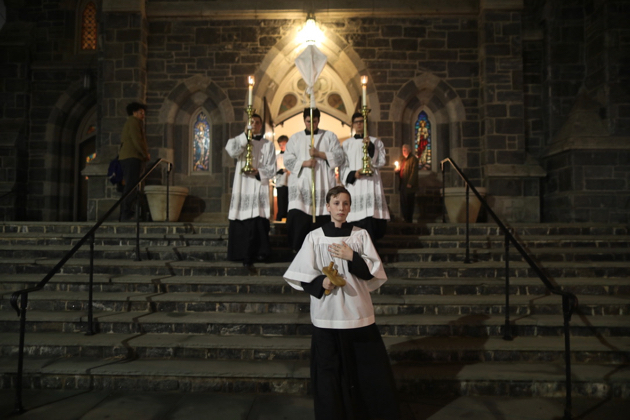 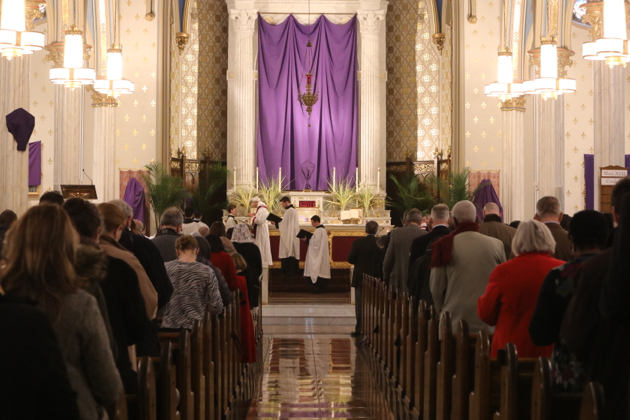 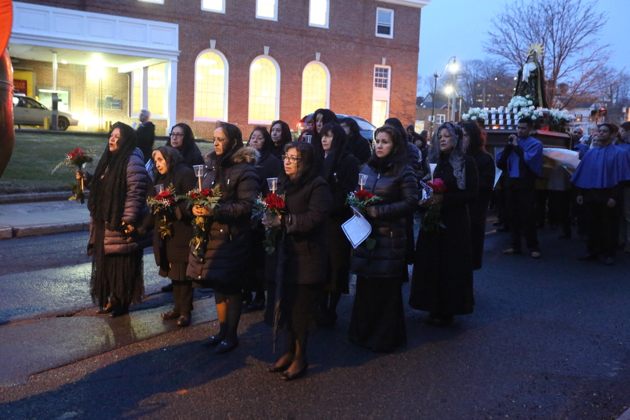 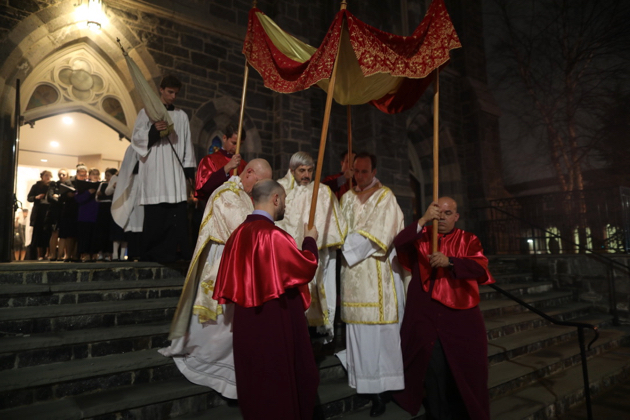 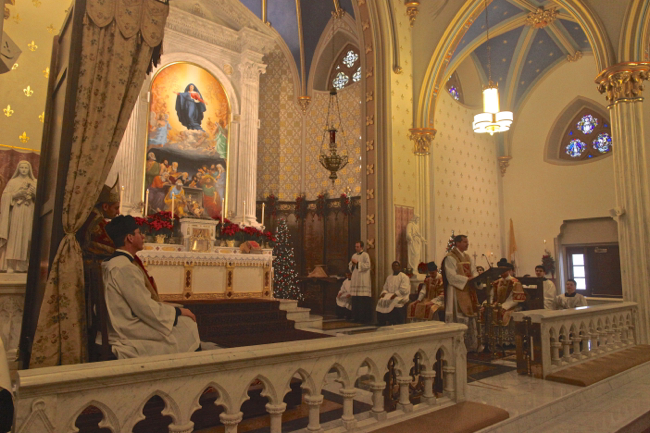 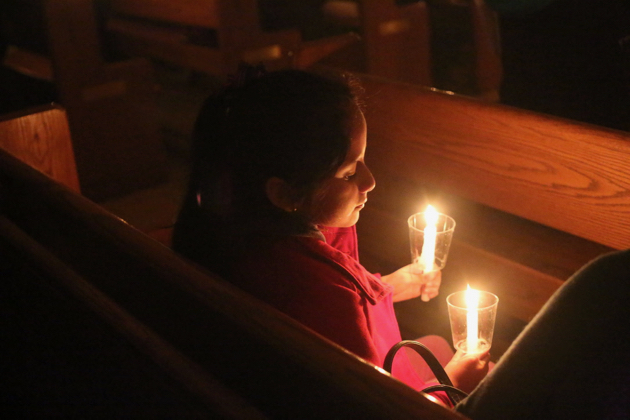 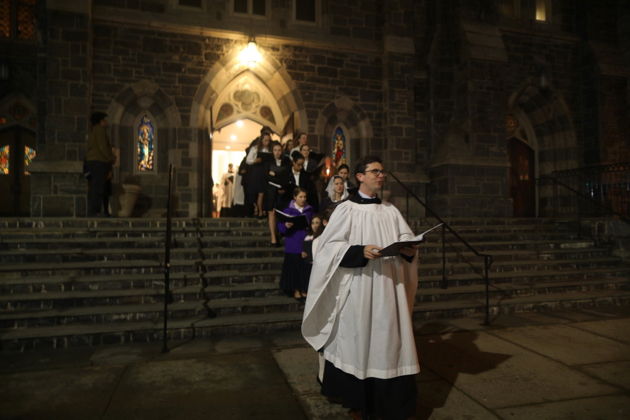 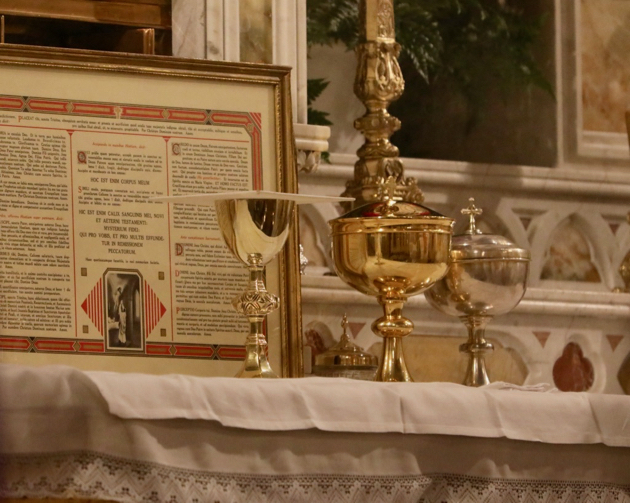 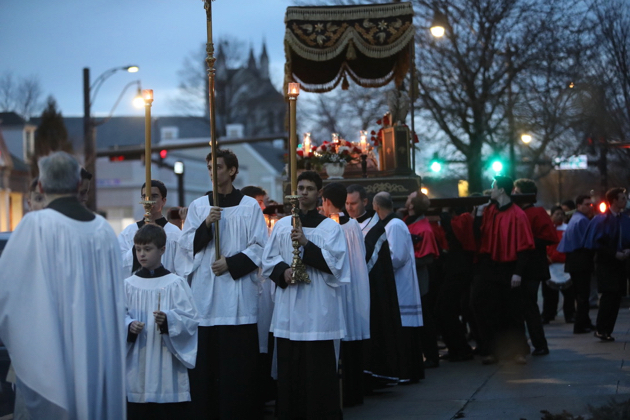 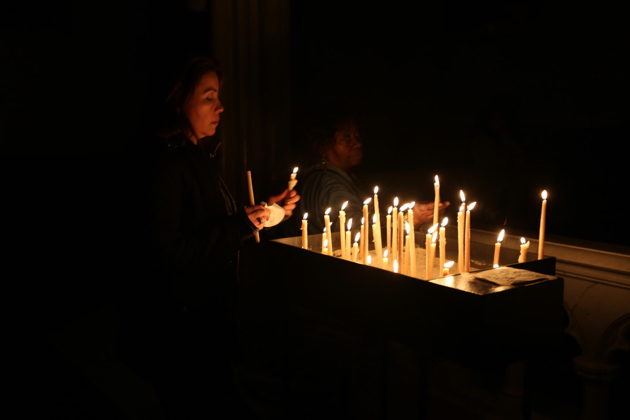 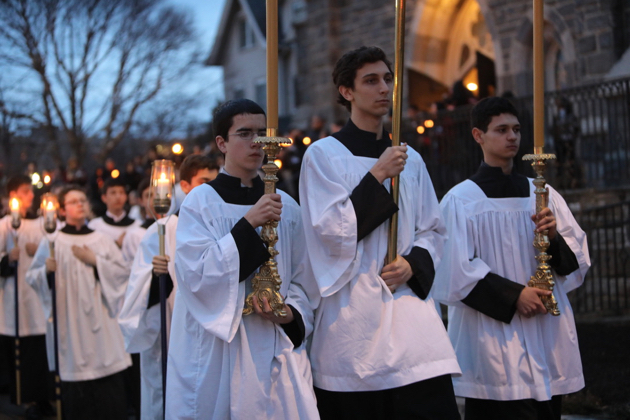 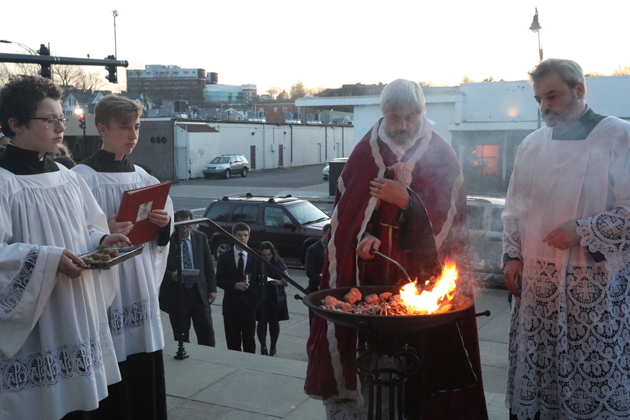 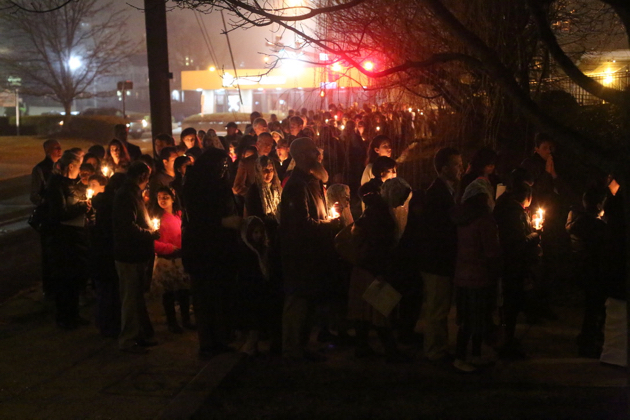 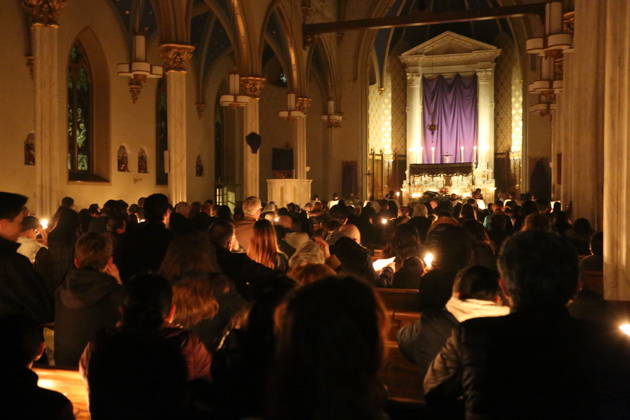 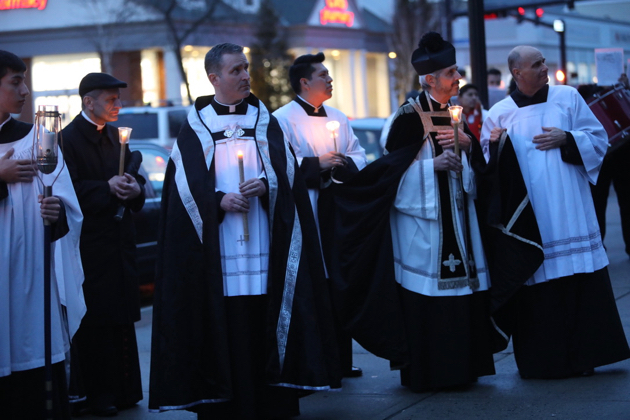 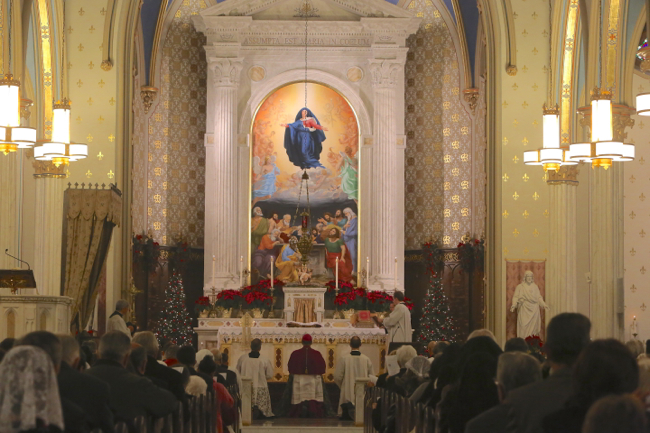 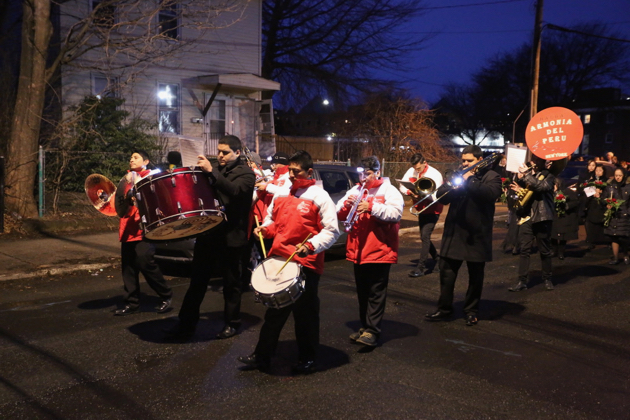 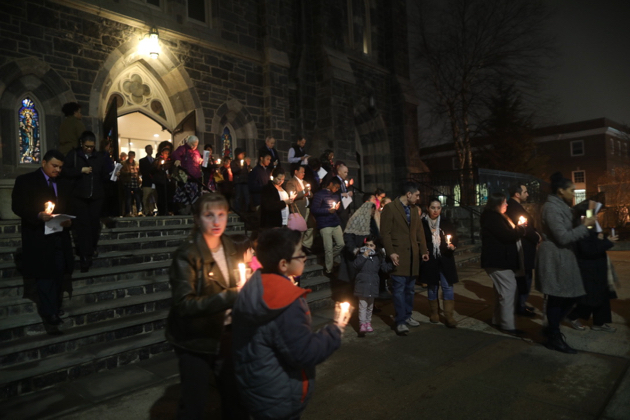 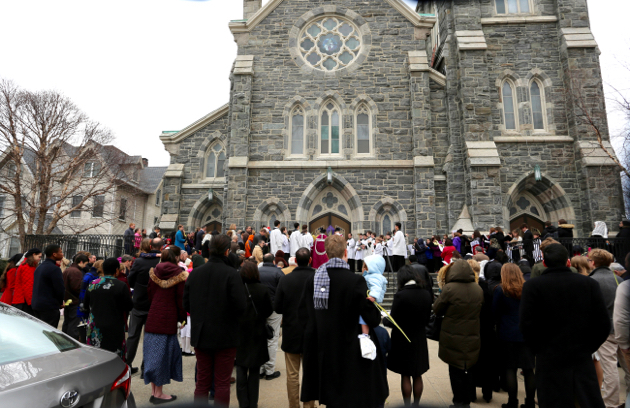 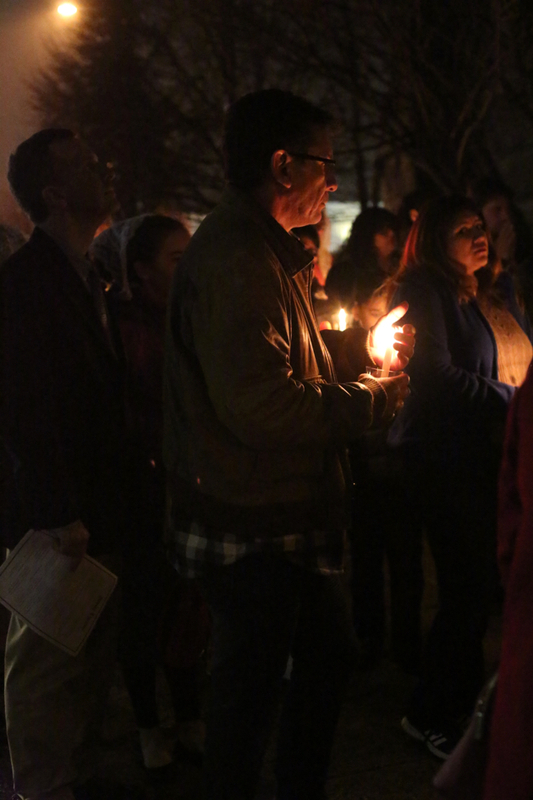 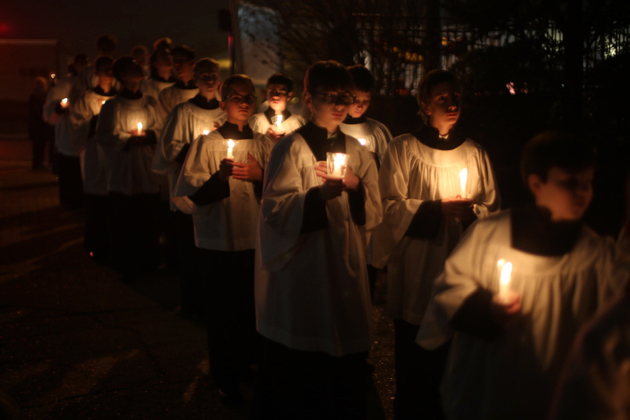 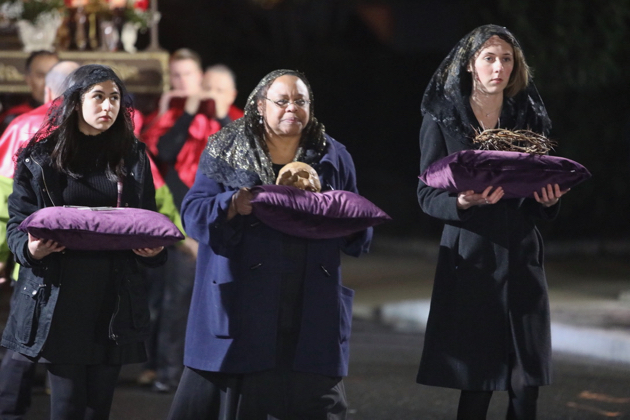 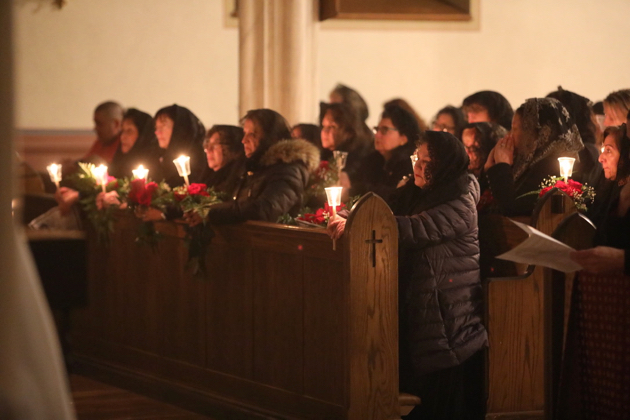 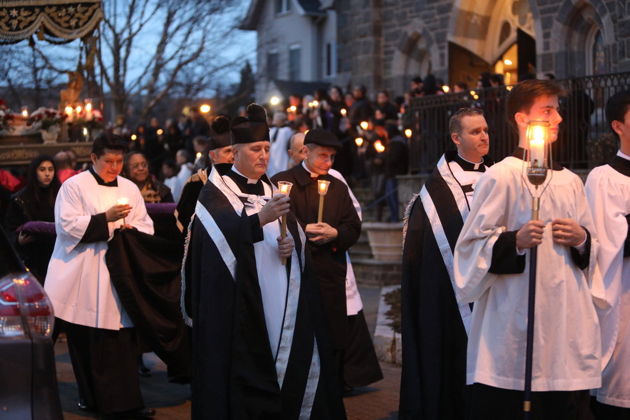 The Paschal Vigil represents the culmination of the Church’s liturgical year. 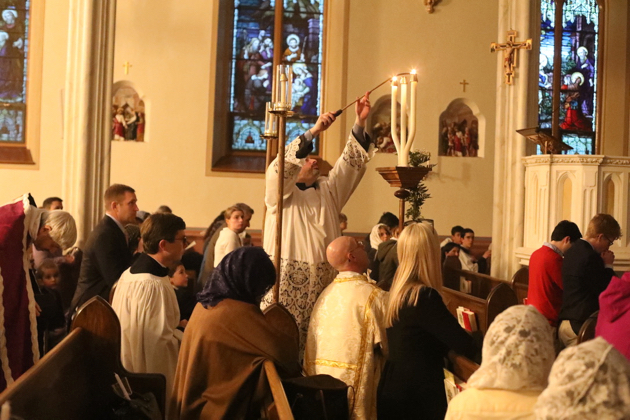 The faithful await the crucified Christ, resurrected from the tomb, just as the catechumens of this night will die to sin in the waters of baptism, and will be resurrected with Christ into a new and eternal life. 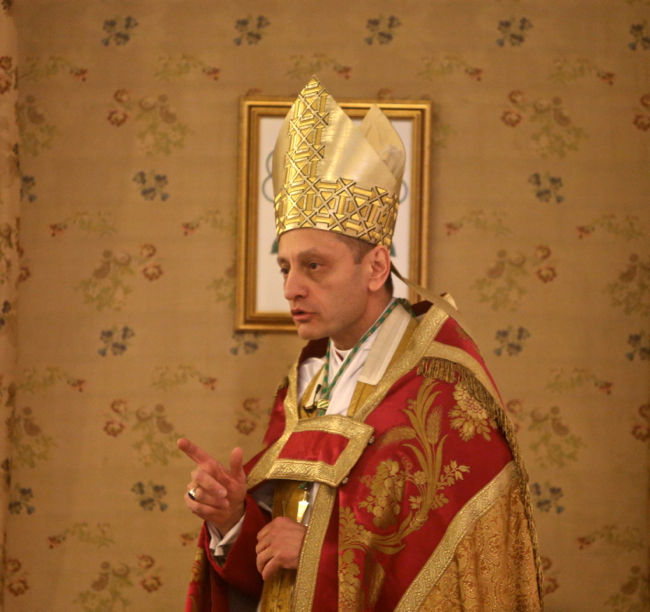 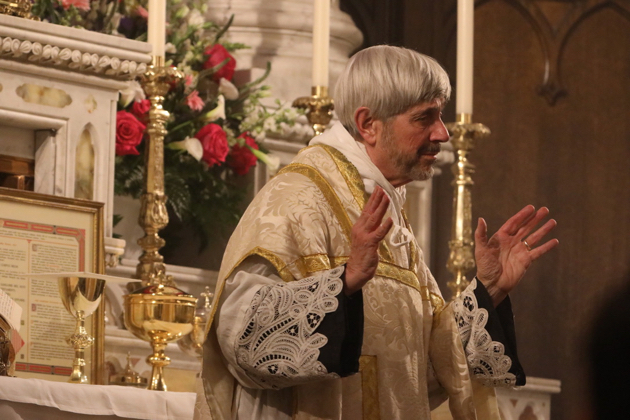 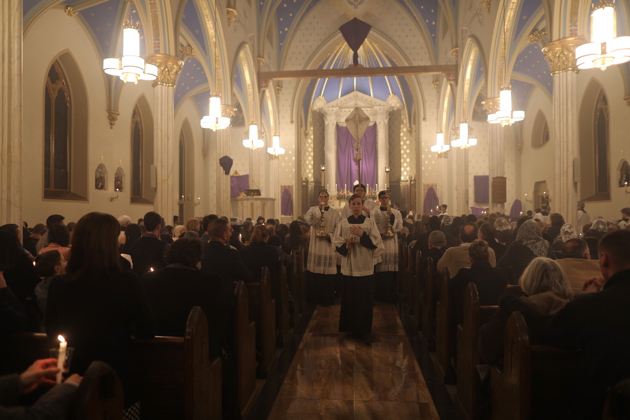 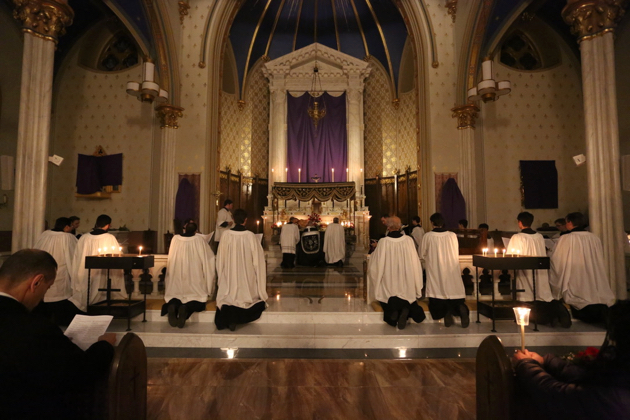 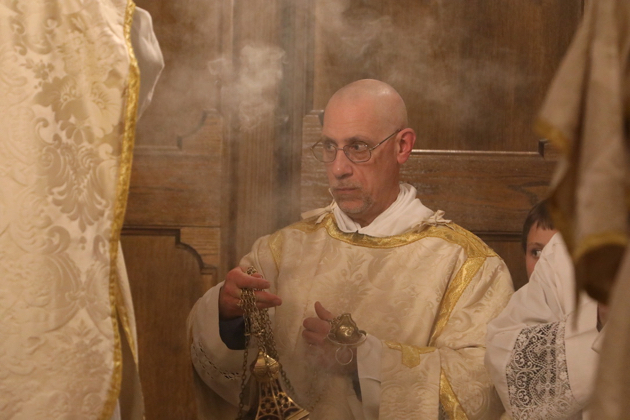 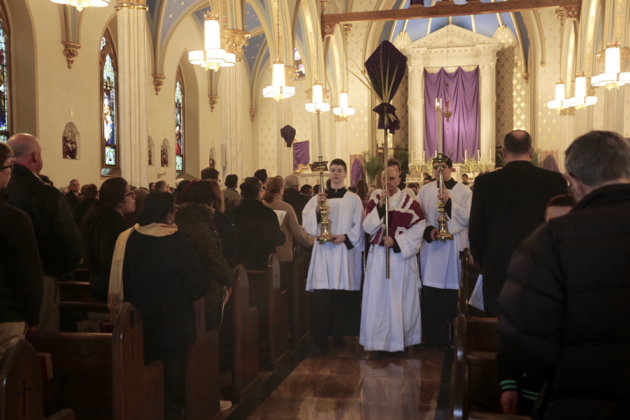 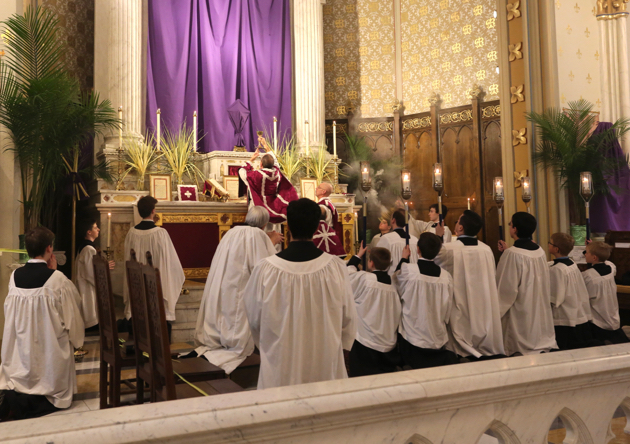 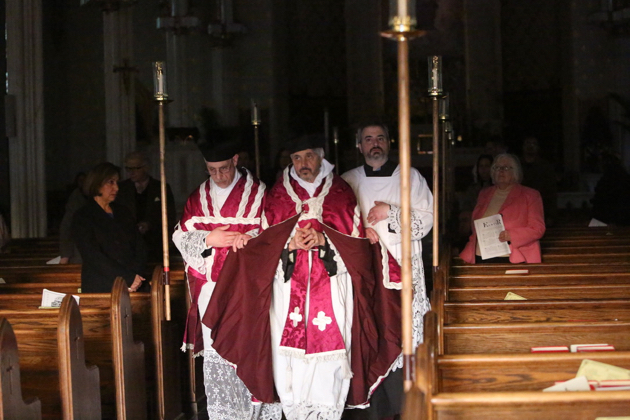 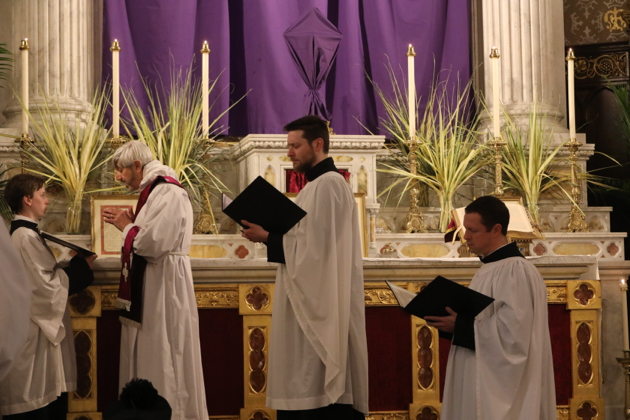 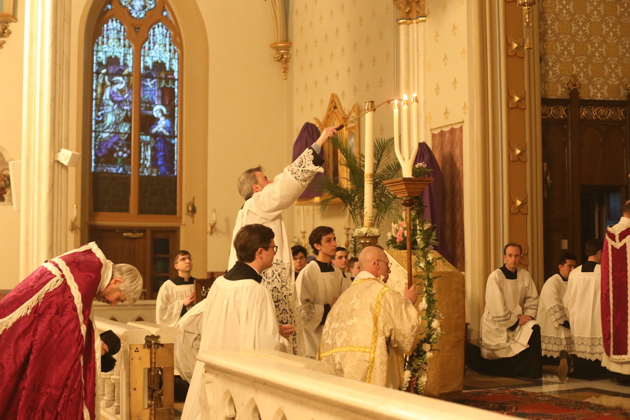 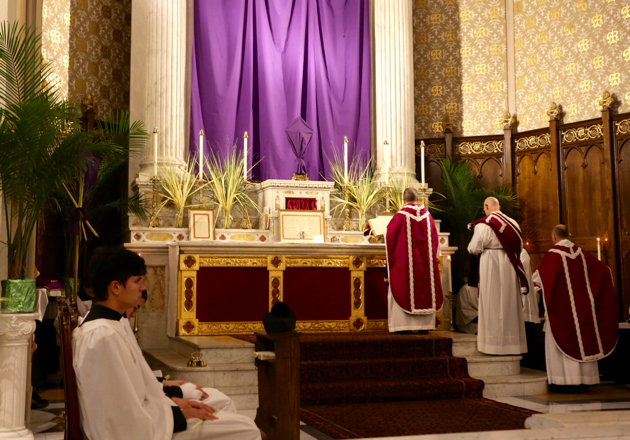 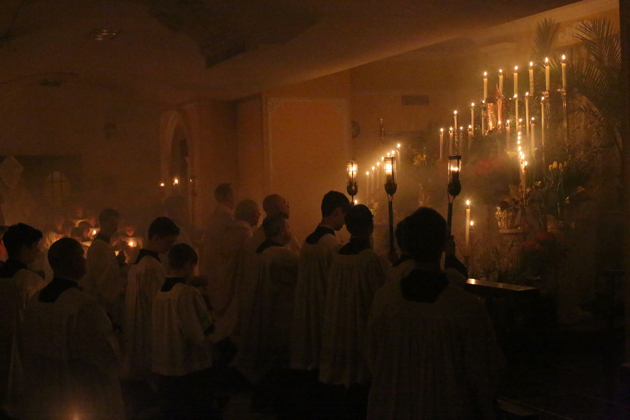 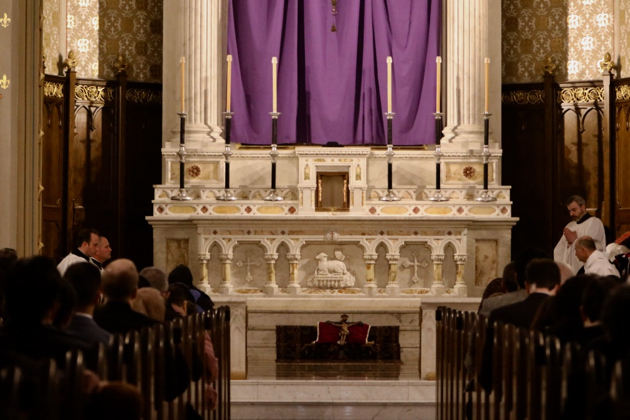 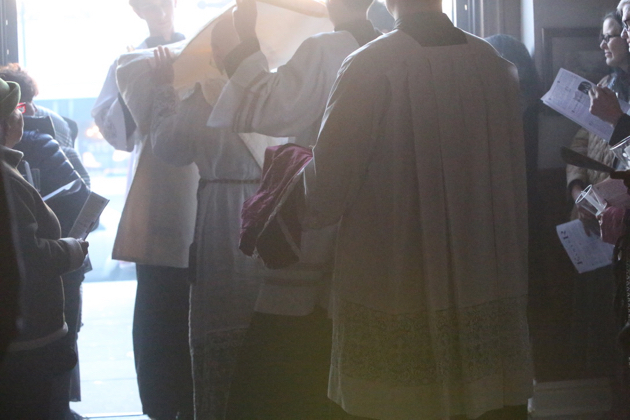 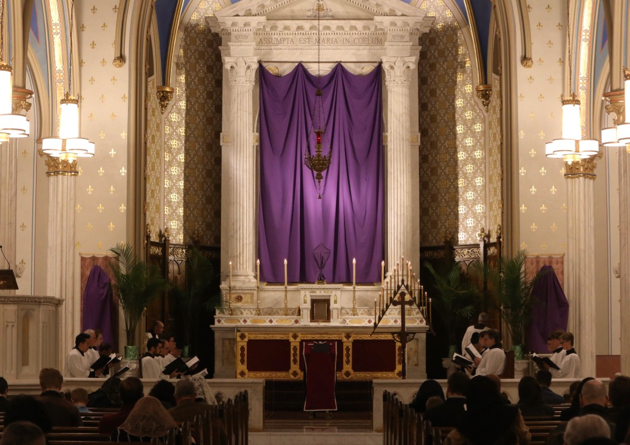 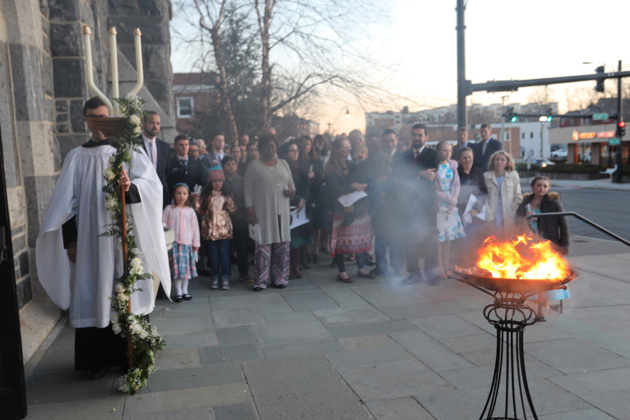 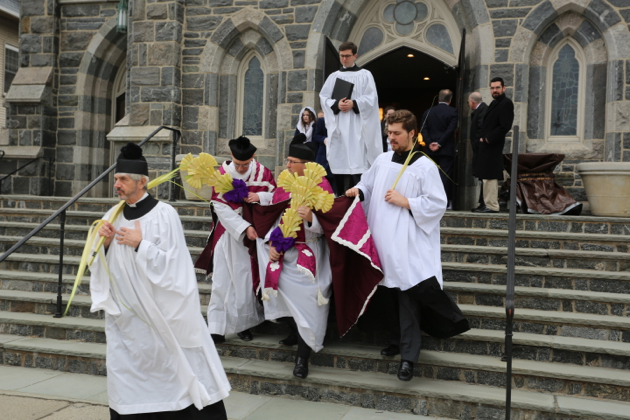 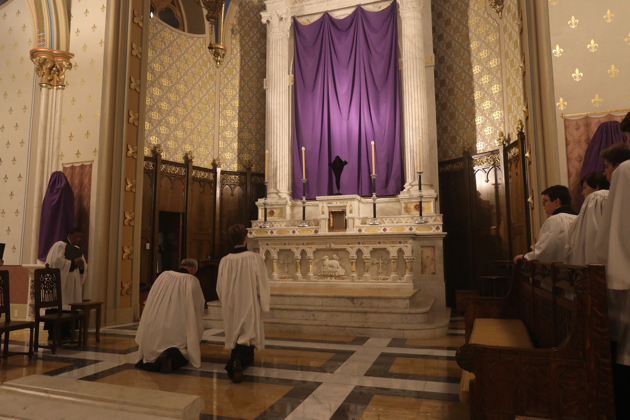 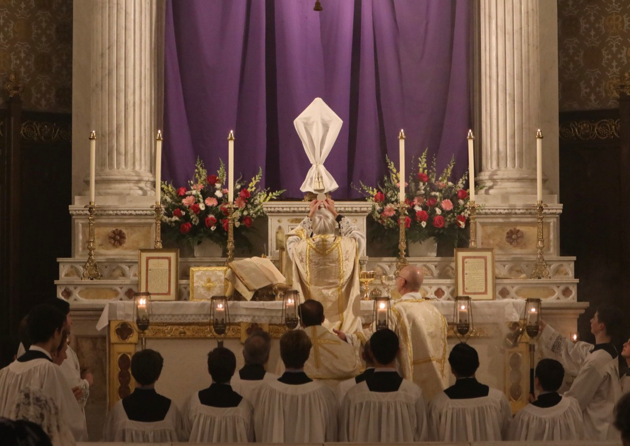 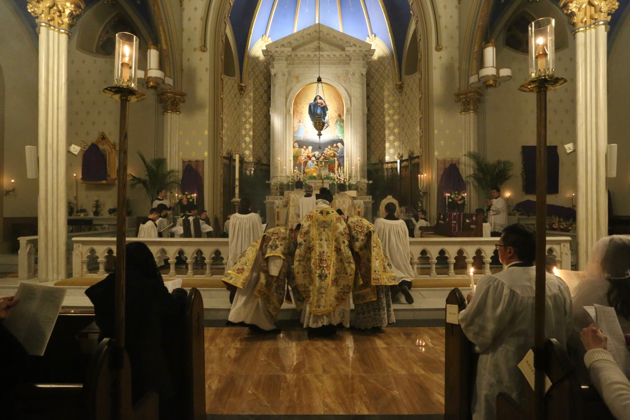 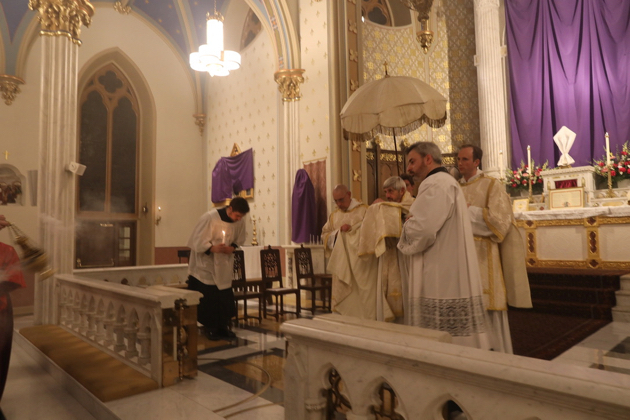 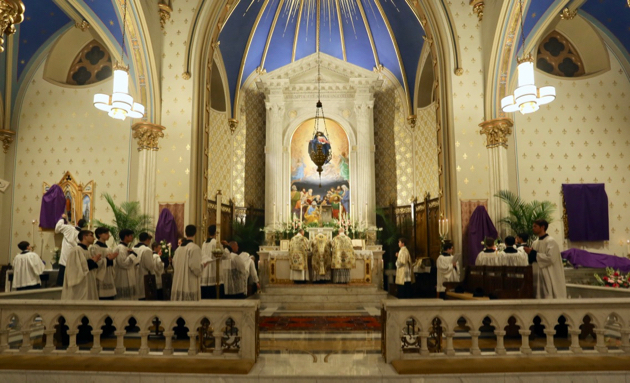 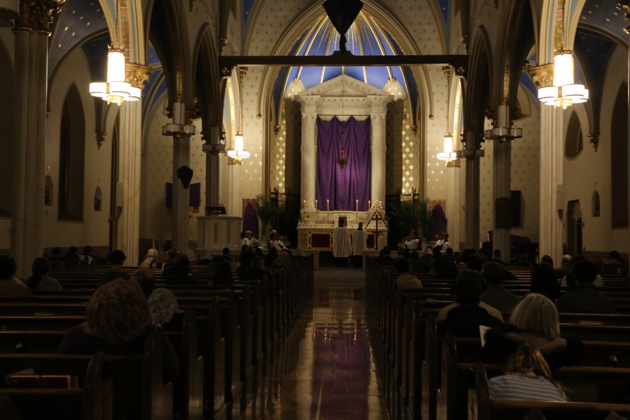 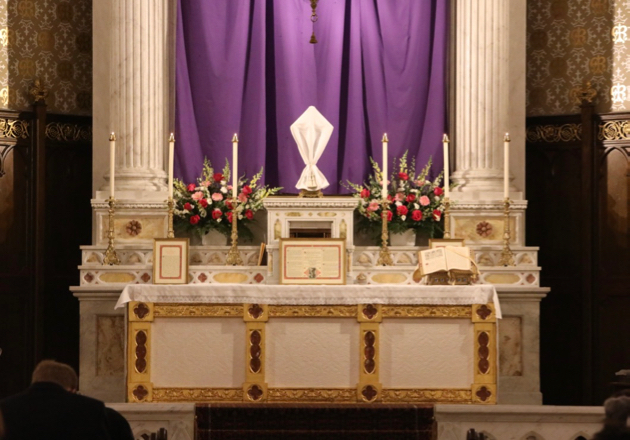 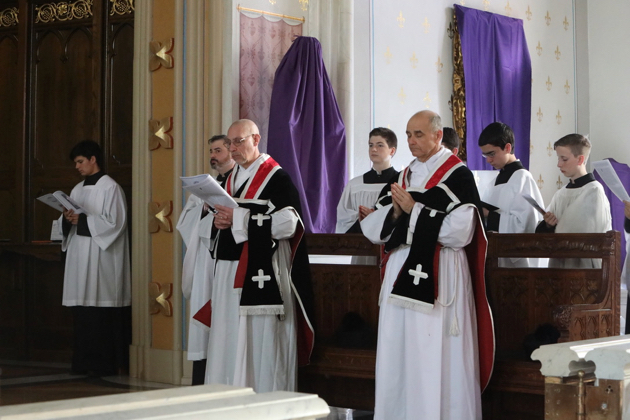 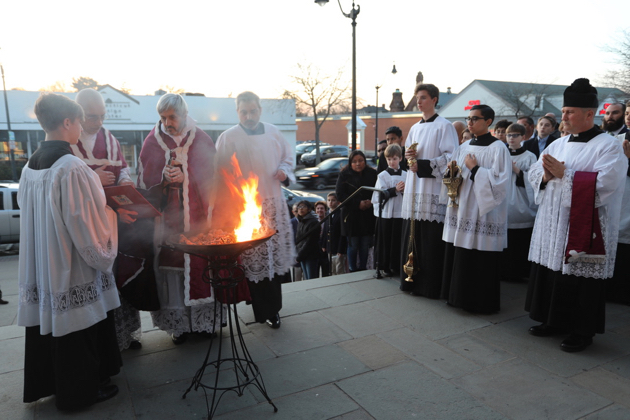 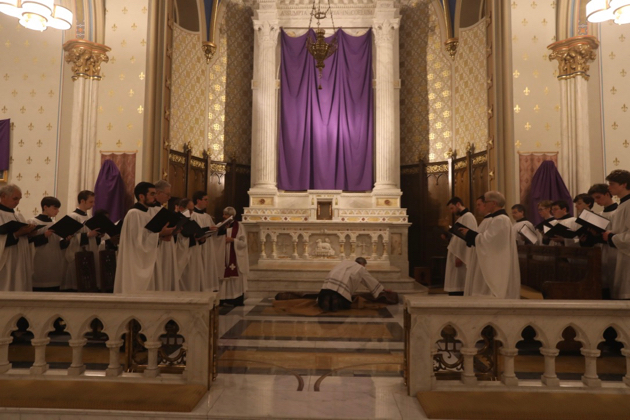 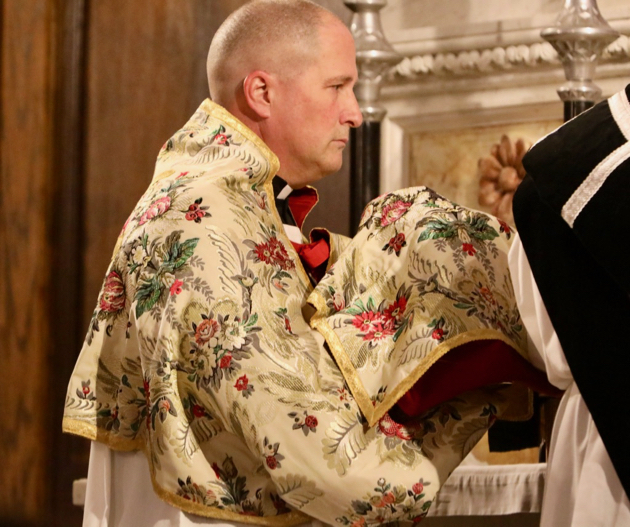 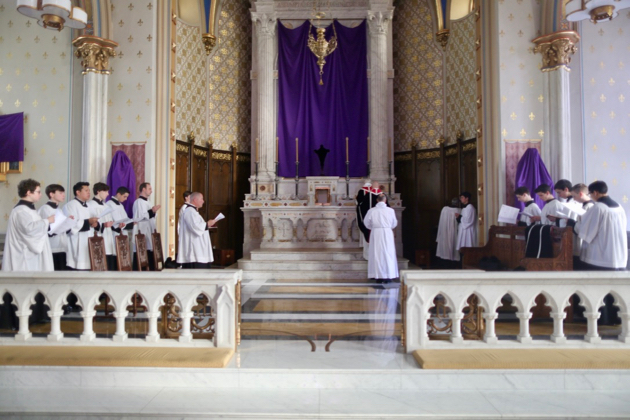 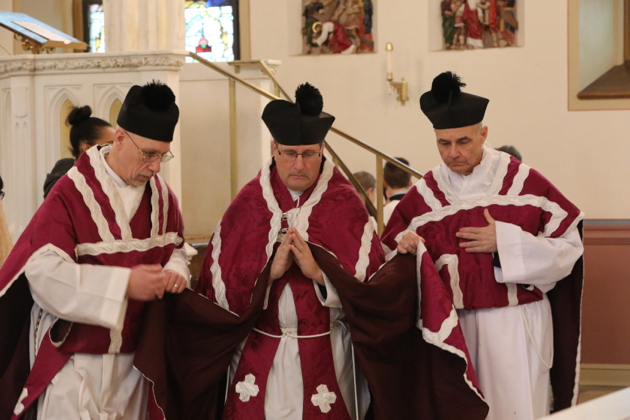 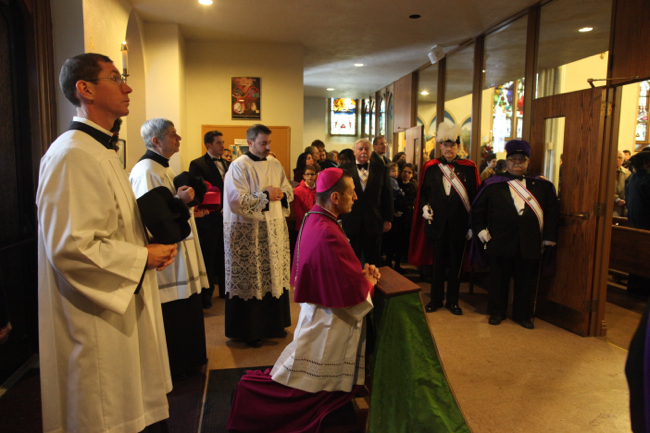 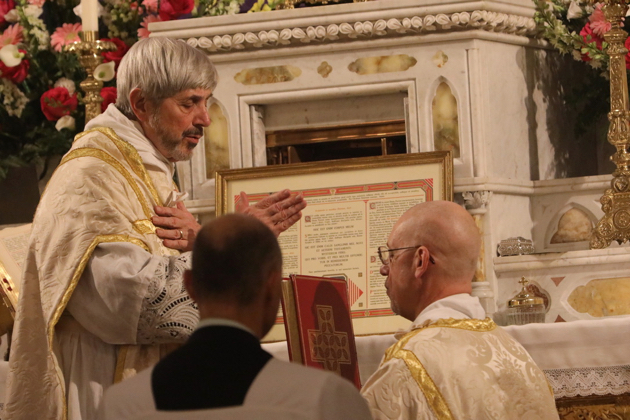 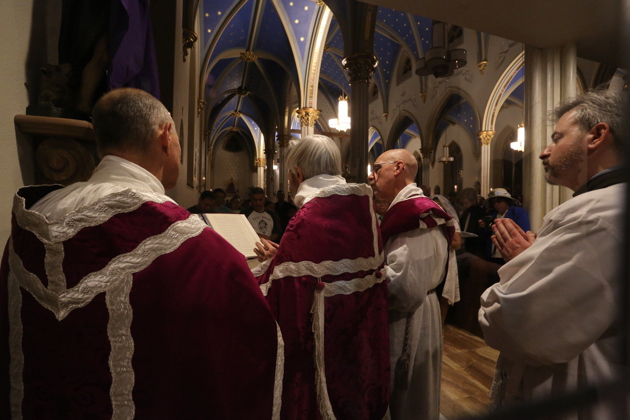 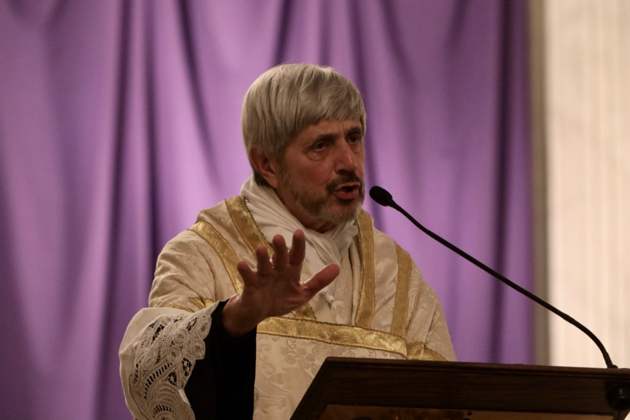 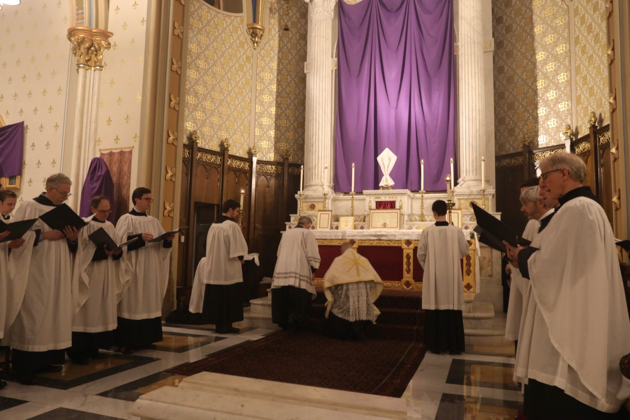 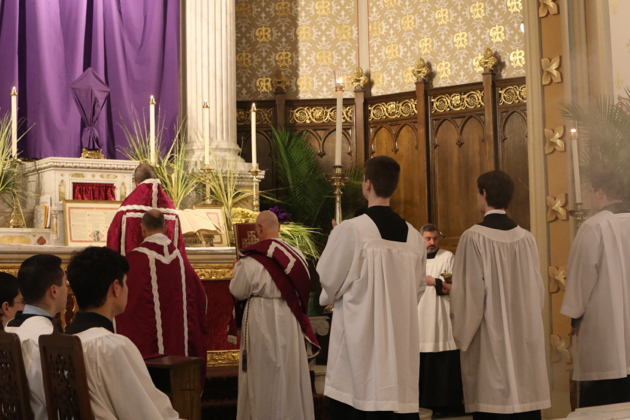 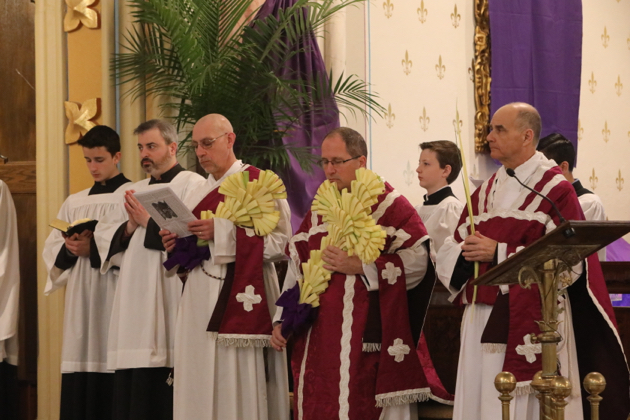 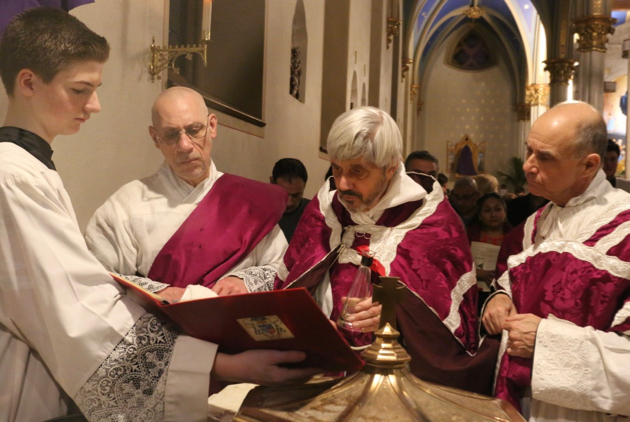 The celebrant and ministers—vested in penitential violet, the celebrant in cope, the ministers in folded chasubles—approach to sactify the new fire, in anticipation of the light of Easter Day. 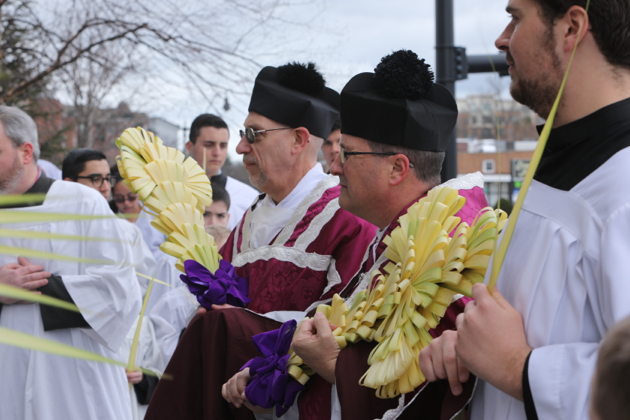 The deacon takes up the triple-branched reed, whose staff represents the bronze serpent which Moses fashioned on a rod to heal the Israelites in the desert, and whose three candles mystically symbolize the three days in the tomb, as well as the three Marys approaching the tomb on Easter morn. 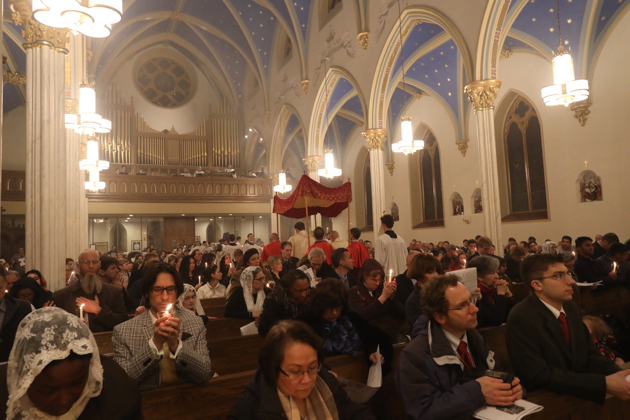 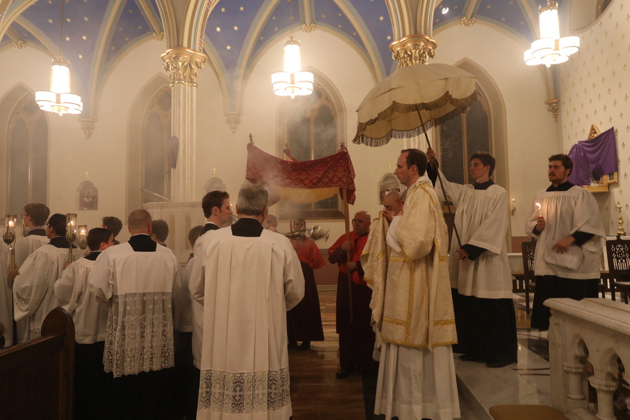 A taper is lit from the new fire, and a procession is formed; the faithful follow the clergy into the church. 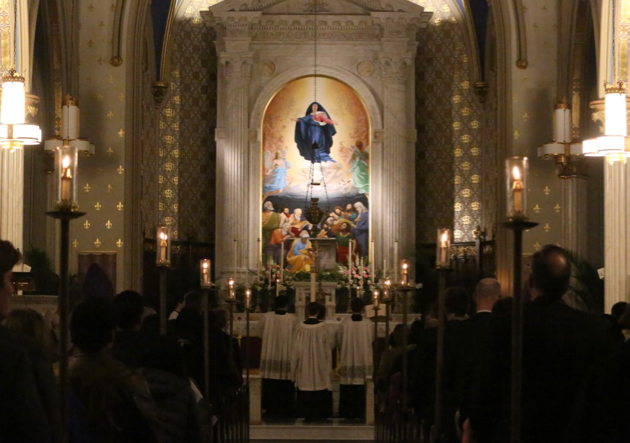 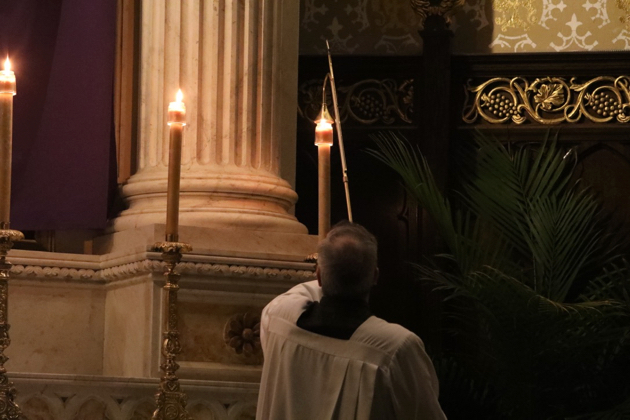 Three times along the way the procession stops, and one of the three candles in lighted from the new fire: at each lighting the faithful should genuflect, save the subdeacon who bears the cross. 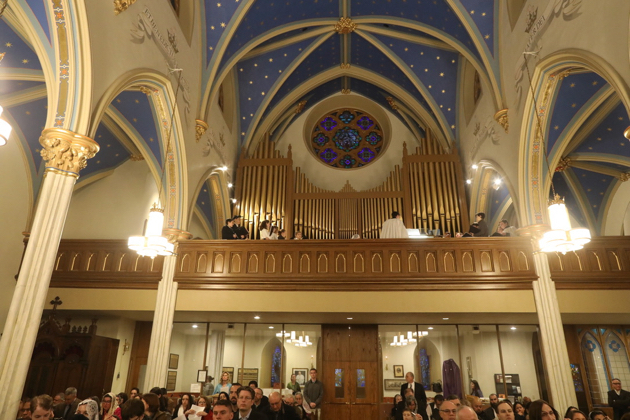 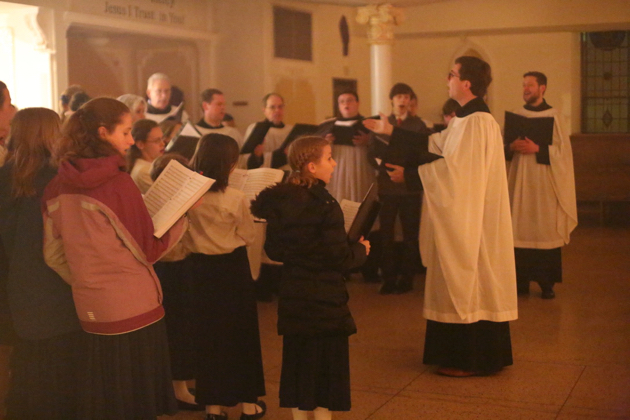 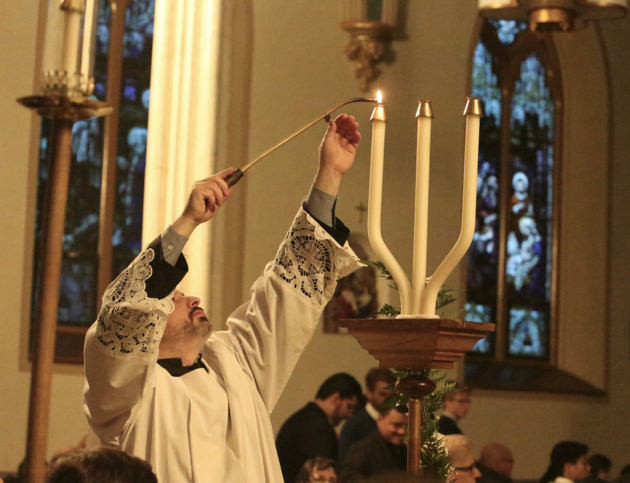 The deacon sings “The light of Christ” each time on a higher pitch, to which the people respond “Thanks be to God”. 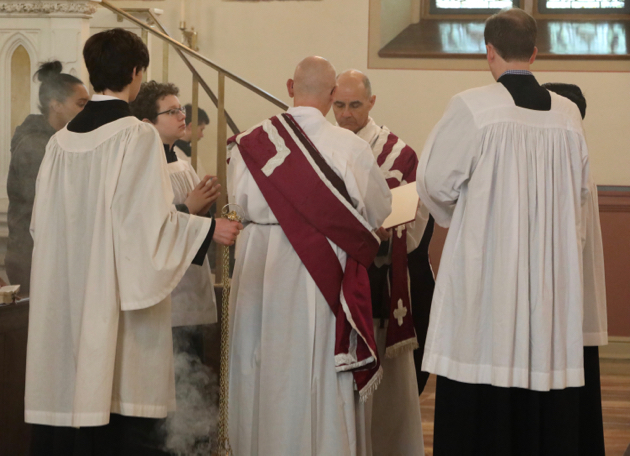 When the sacred ministers achieve the sanctuary, the deacon hands the reed over, and seeks a blessing from the celebrant. 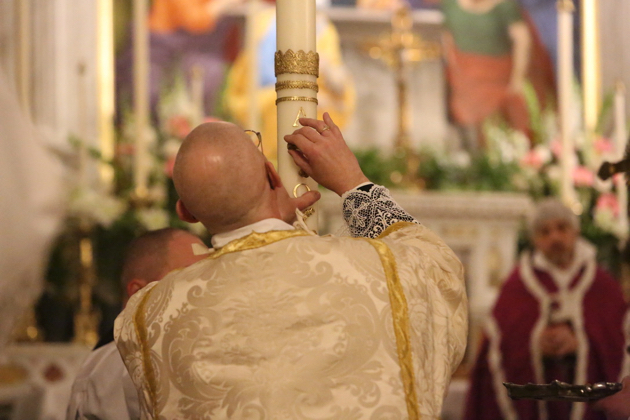 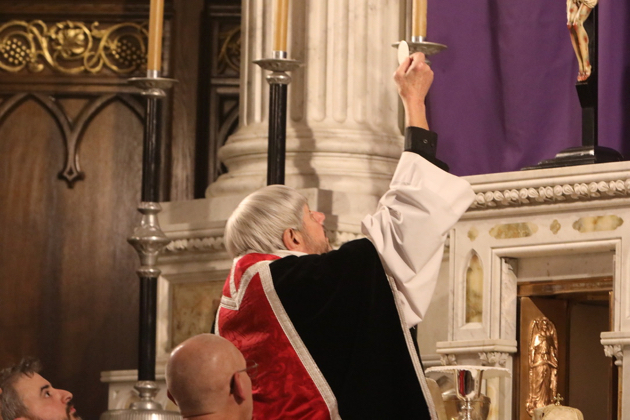 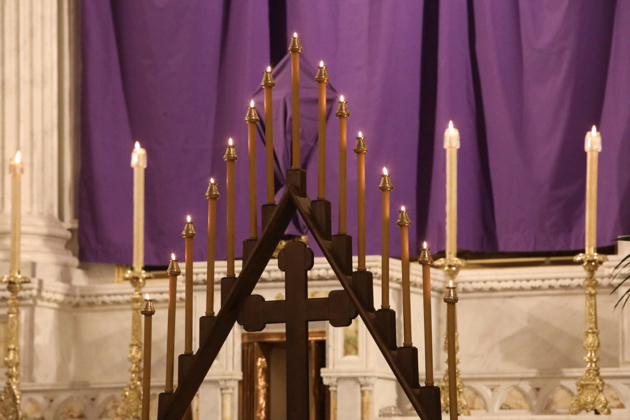 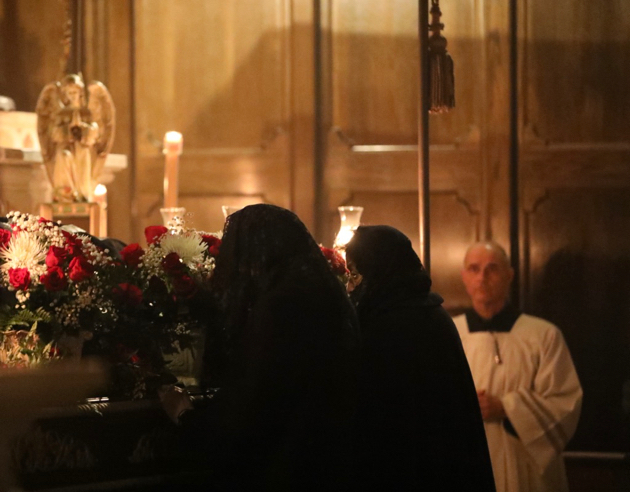 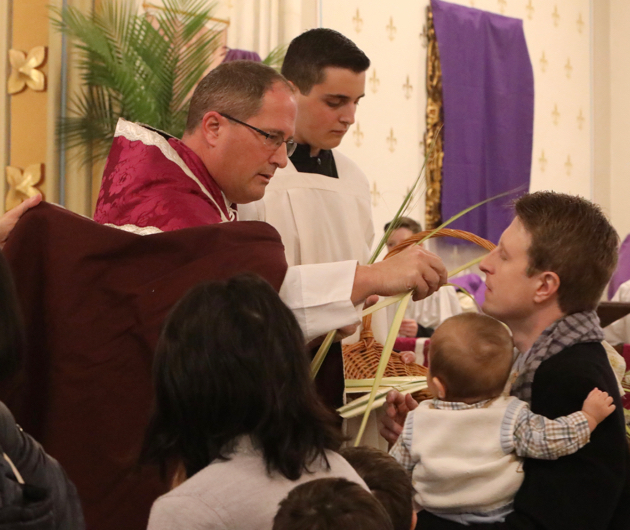 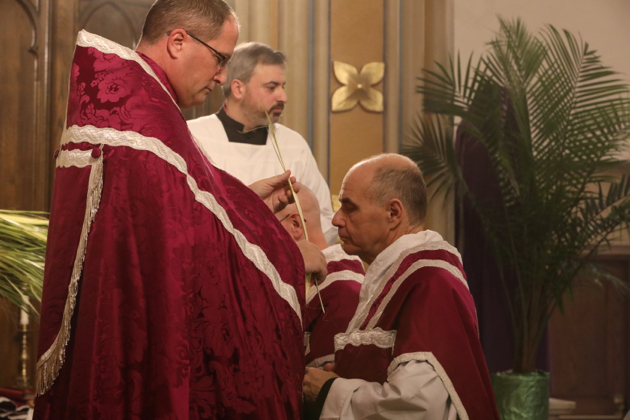 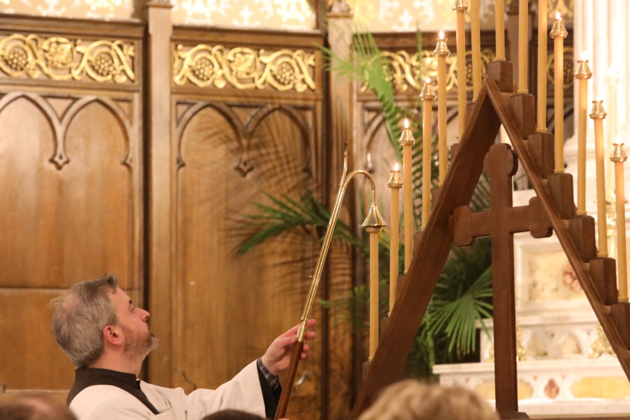 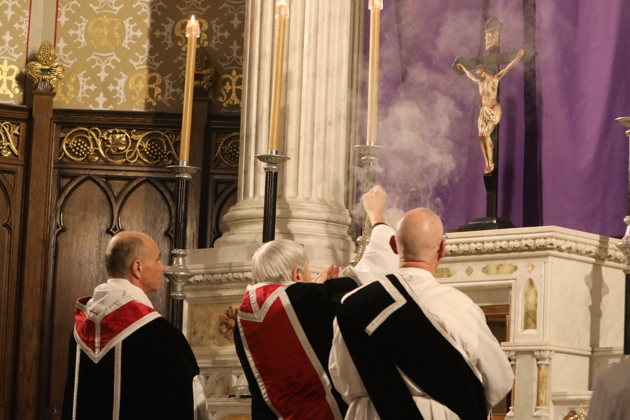 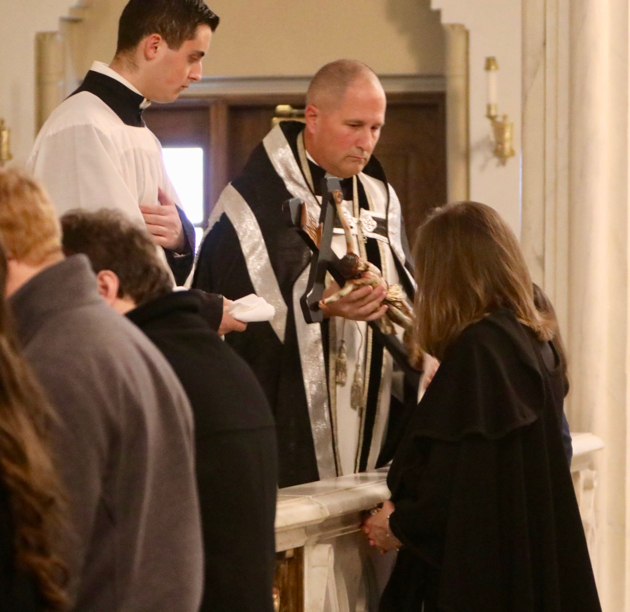 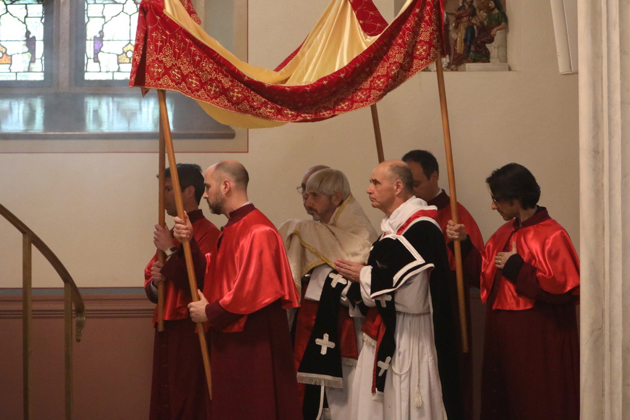 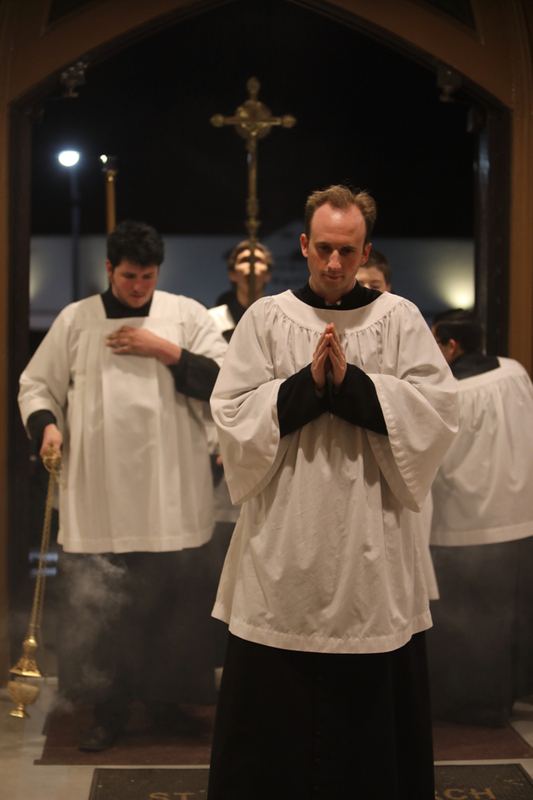 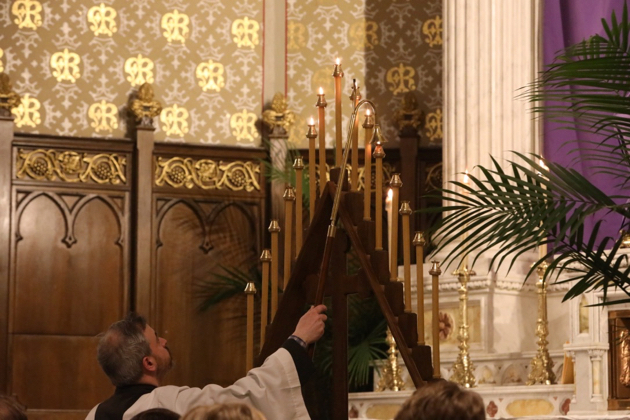 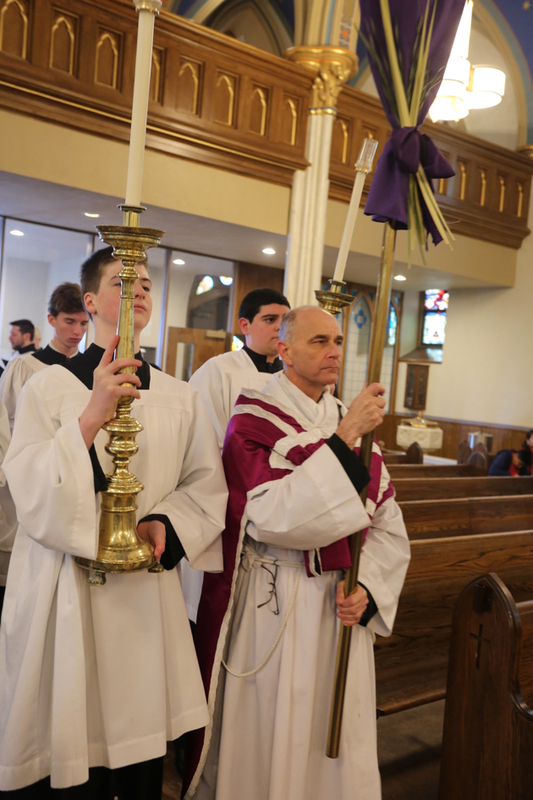 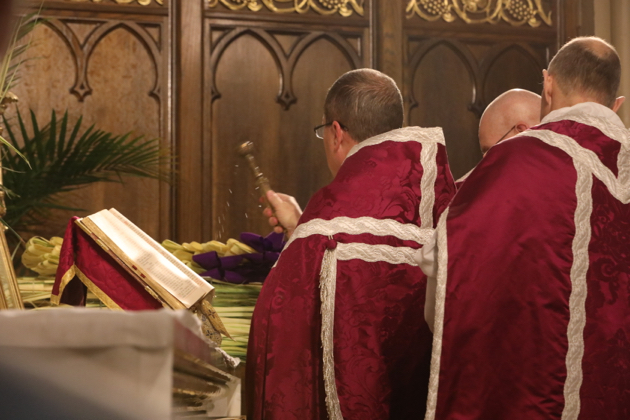 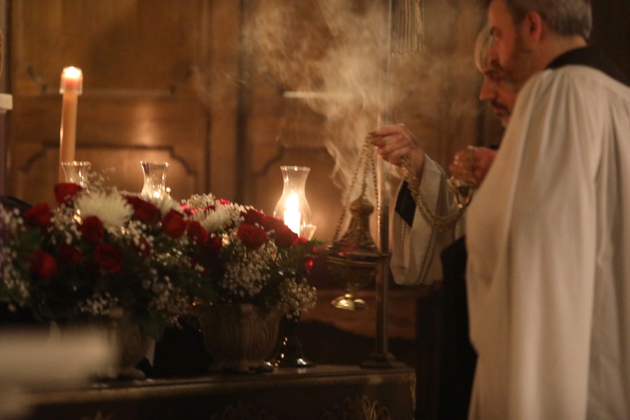 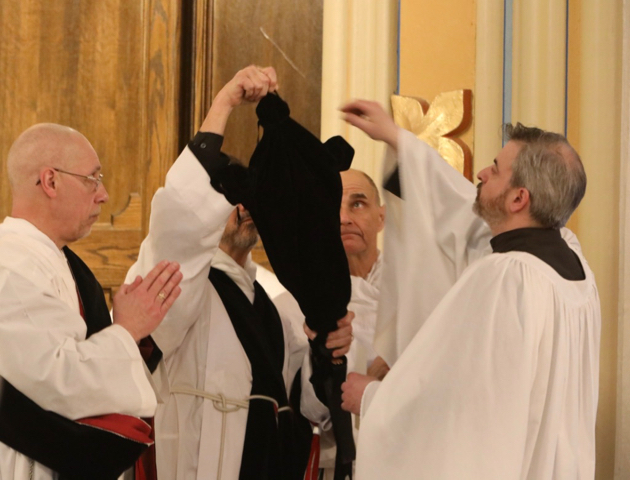 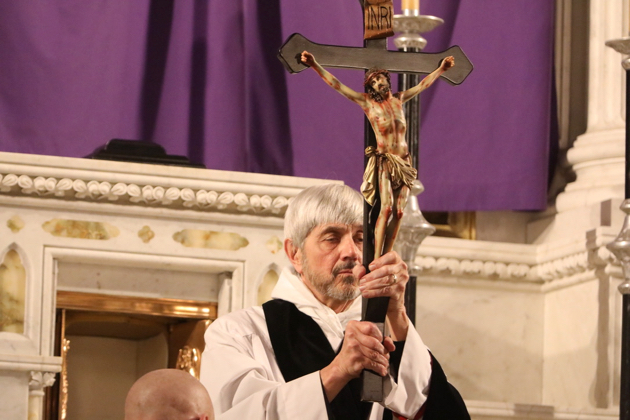 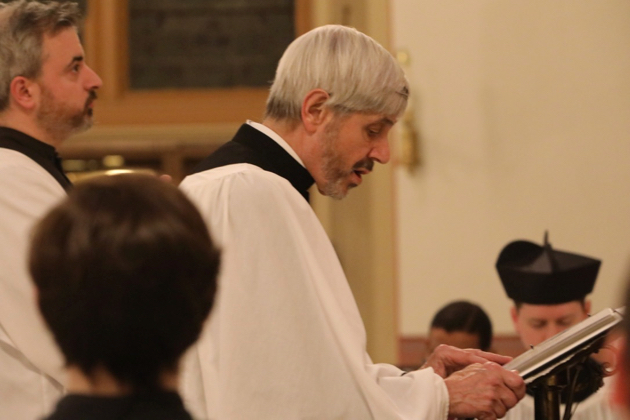 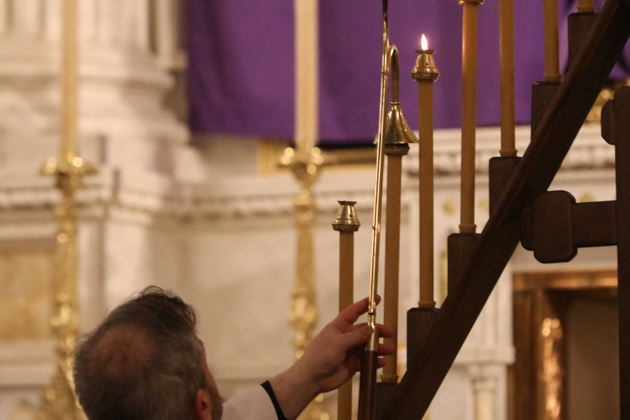 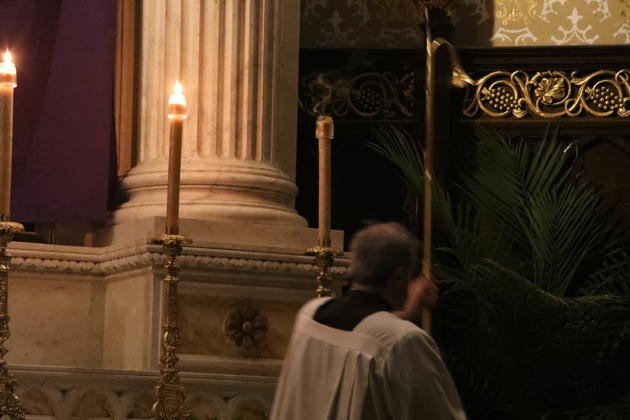 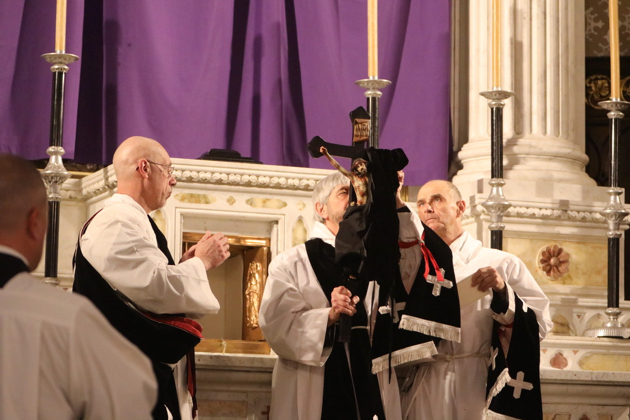 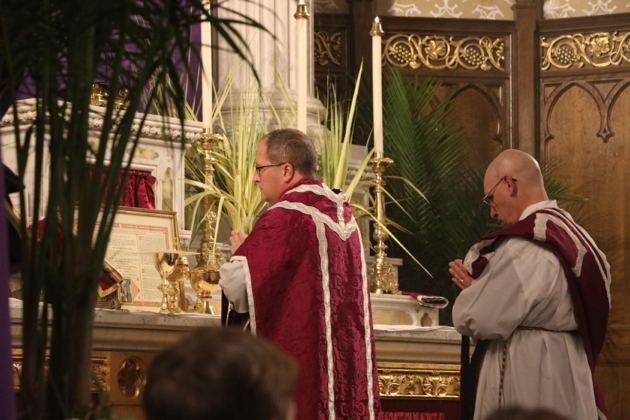 The deacon pauses to pierce the Paschal Candle with the five grains of incense in the form of a cross, symbolizing the five Holy Wounds of our Lord at His crucifixion. 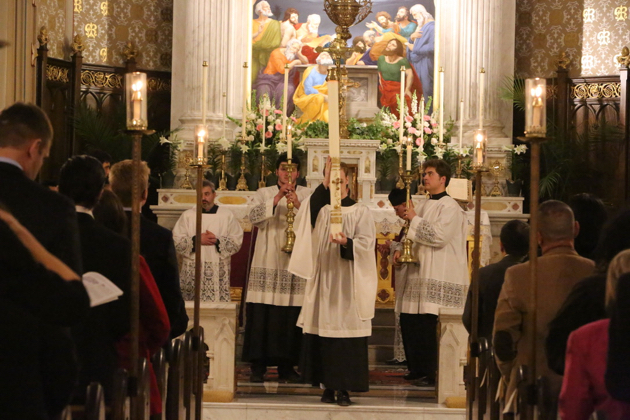 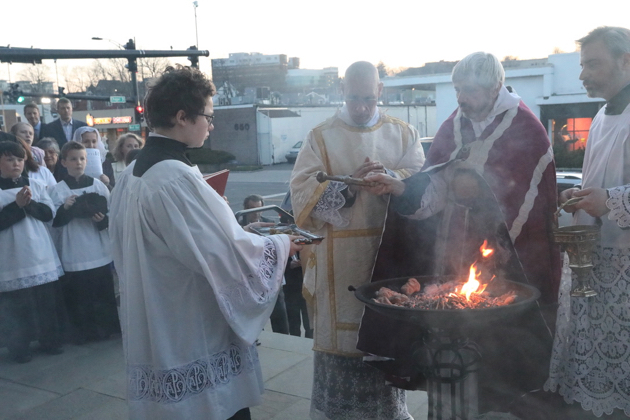 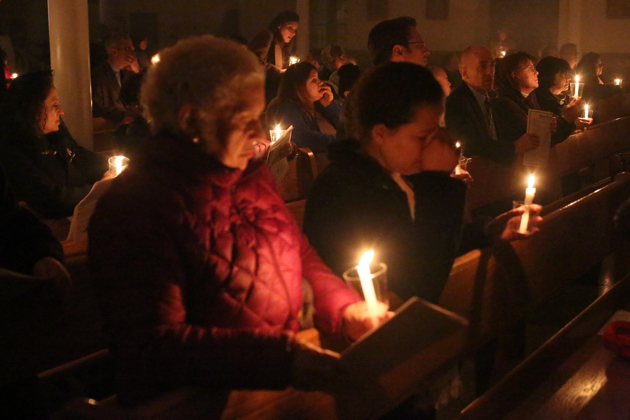 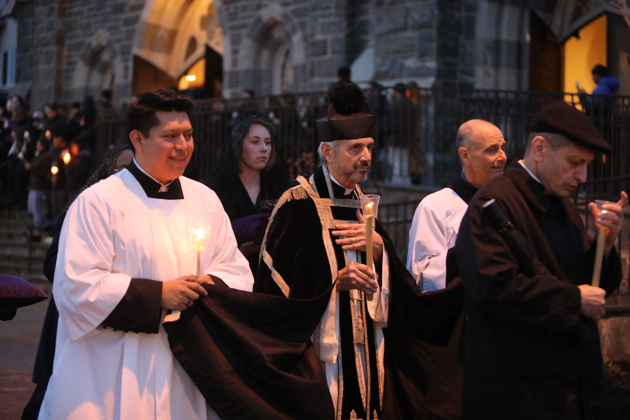 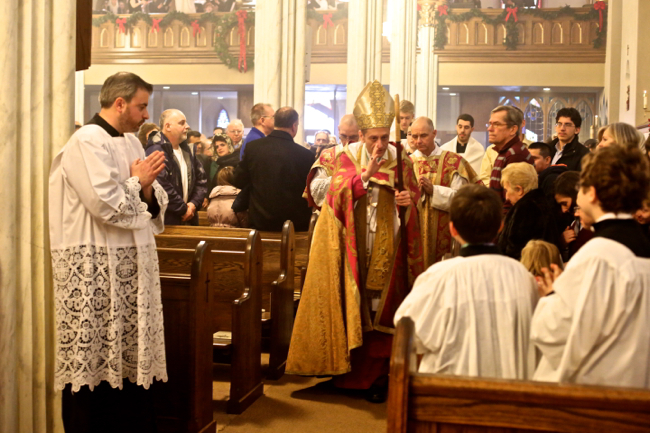 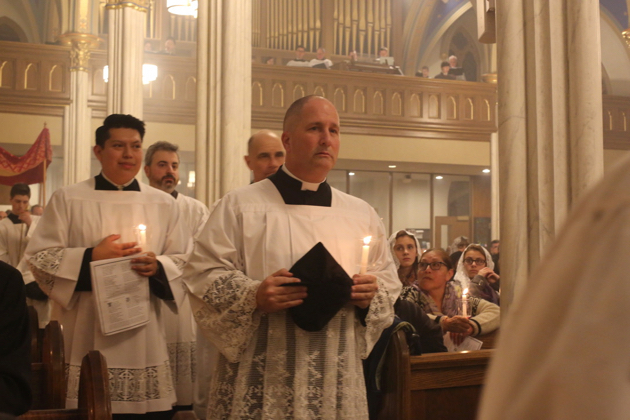 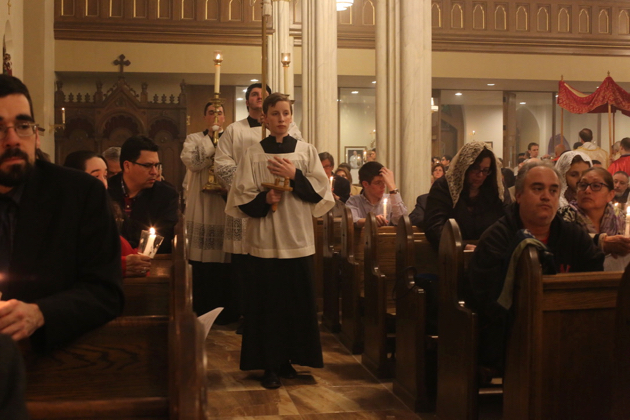 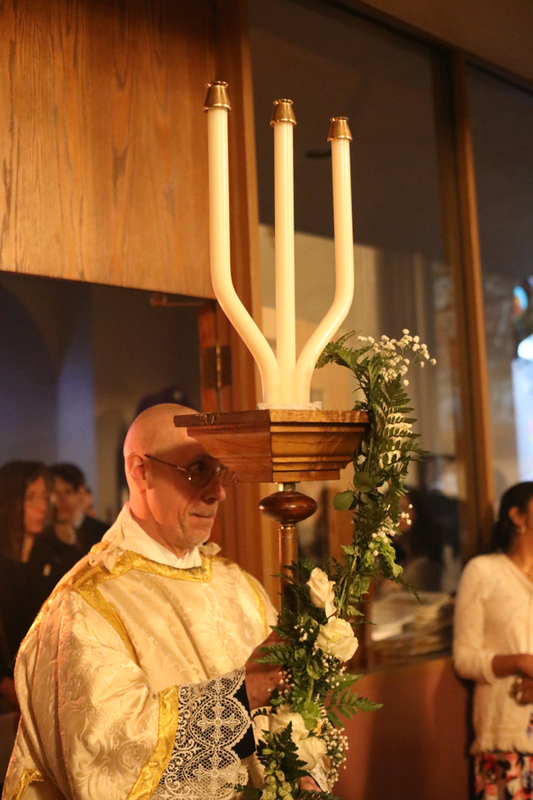 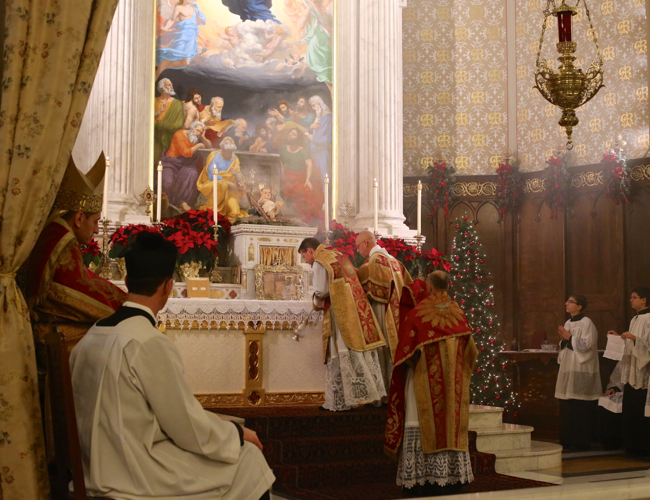 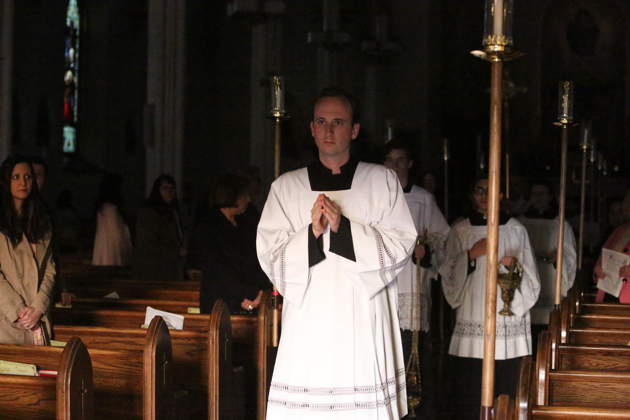 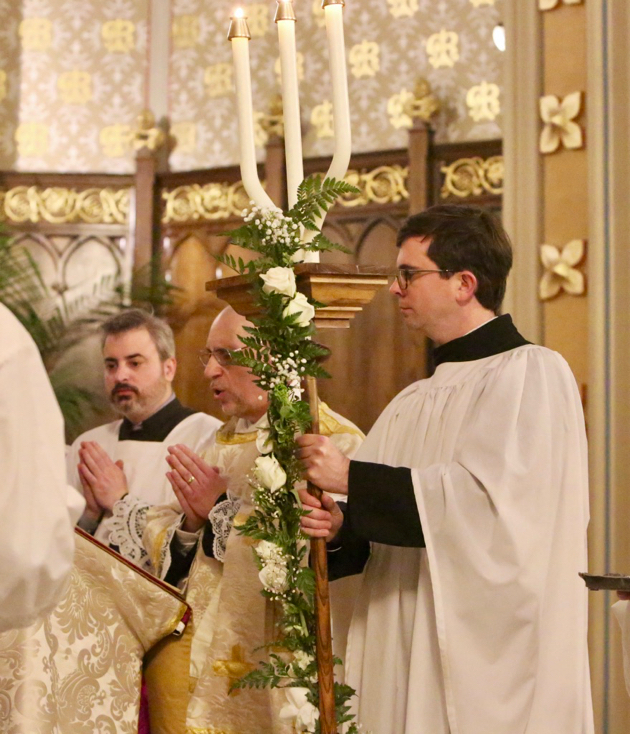 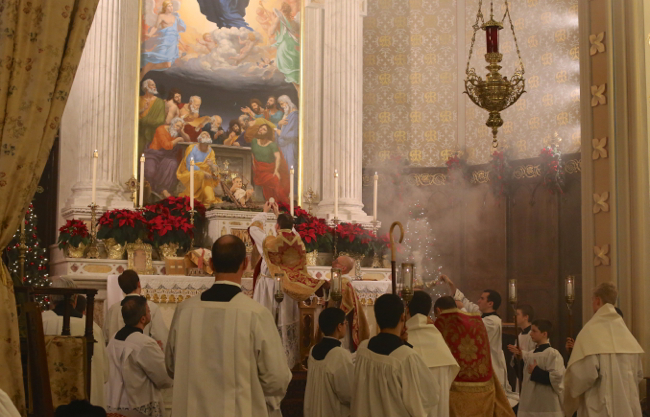 The deacon takes up the reed and lights the Paschal Candle with its flame, which itself was lighted from the new fire. 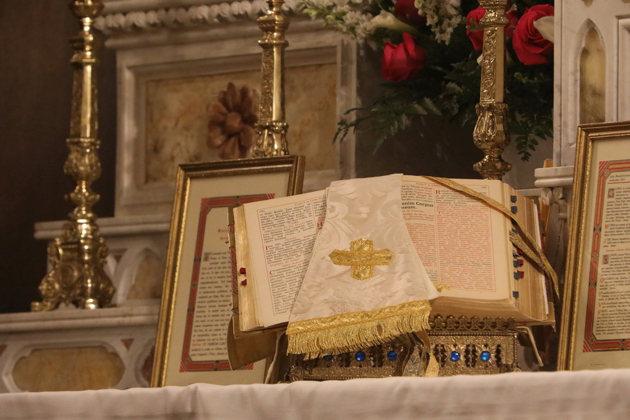 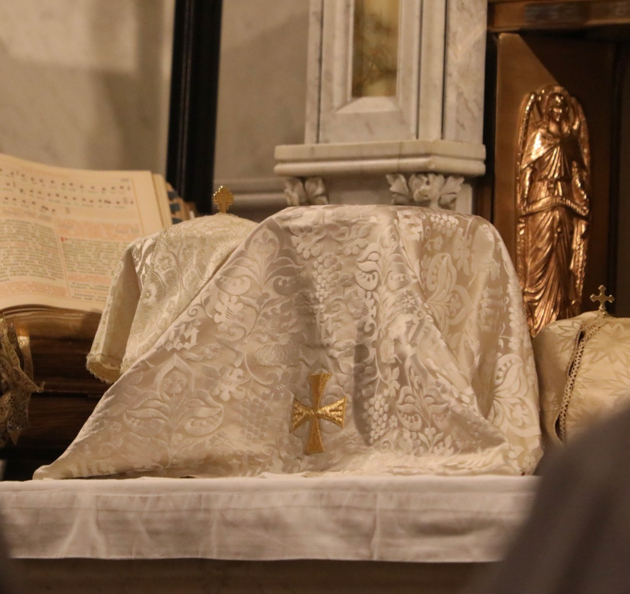 The Prophecies: The Twelve Prophecies of the Vigil are among the oldest cycle of readings known in the Roman Rite, prefiguring our salvation and recounting the duties, trials, and hardships of the Christian, they form the final catechesis for the elect who are to be baptized. 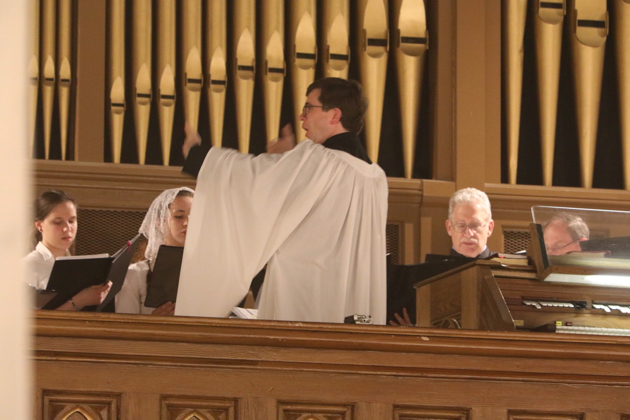 They are sung by a series of lectors to their own tone. 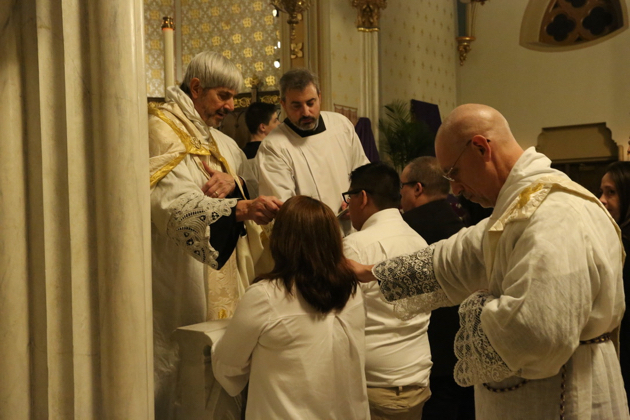 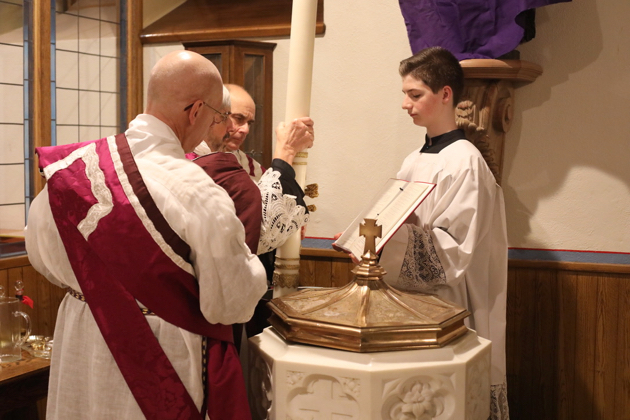 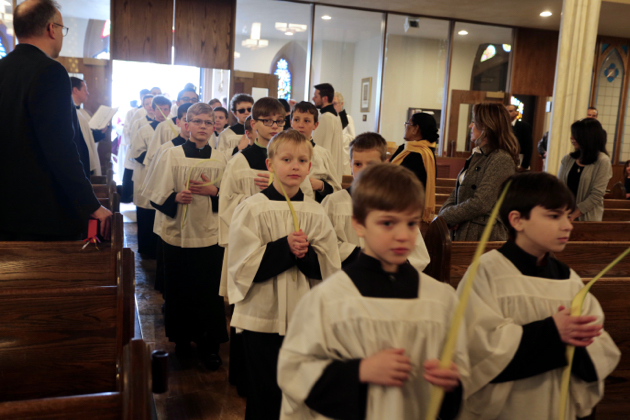 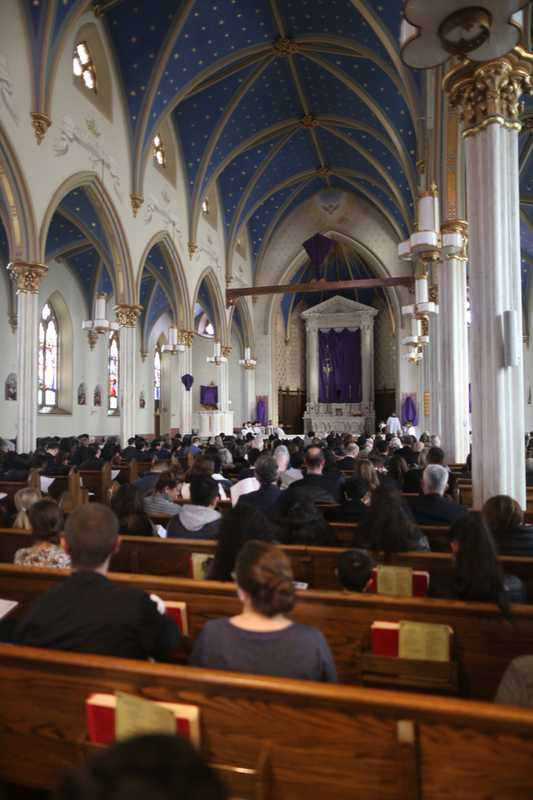 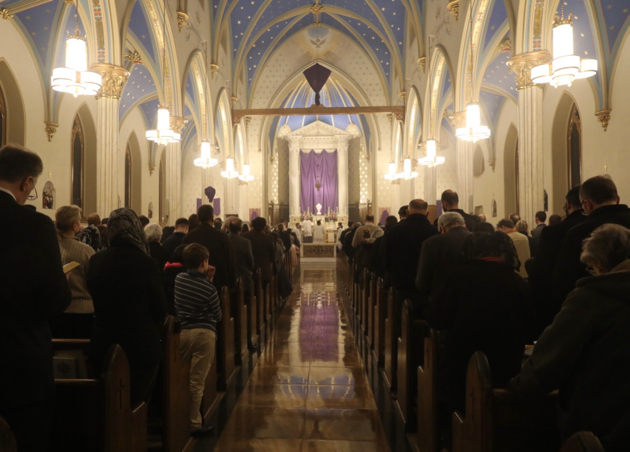 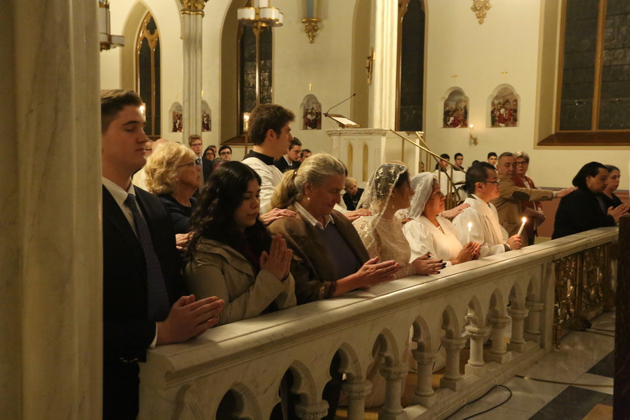 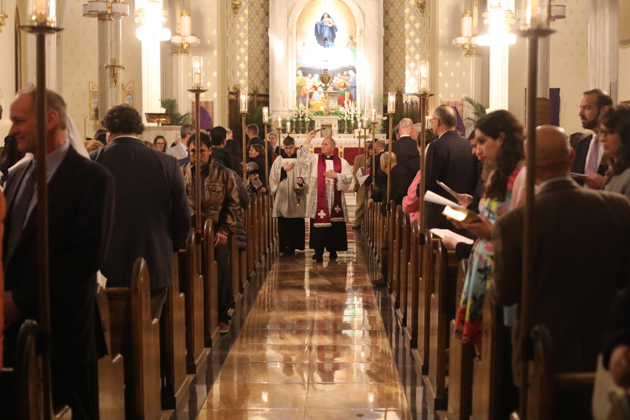 The Christenings: The catechumens to be baptized are now called forward by the deacon, and a procession is formed to the baptistery, in the back of the church, led by the Paschal Candle, as the choir sings the tract “Sicut Cervus,” the soul’s thirst for the grace of God. 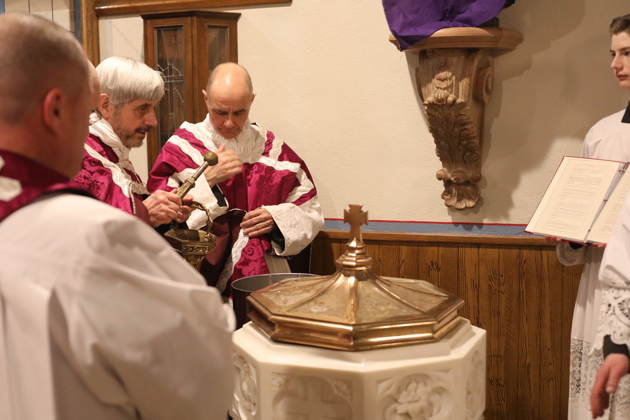 Once inside the baptistery, the celebrant prays over the font, that the Lord will deign to remake those about to die to their old selves in its waters into His spiritual sons and daughters by the grace of His Spirit. 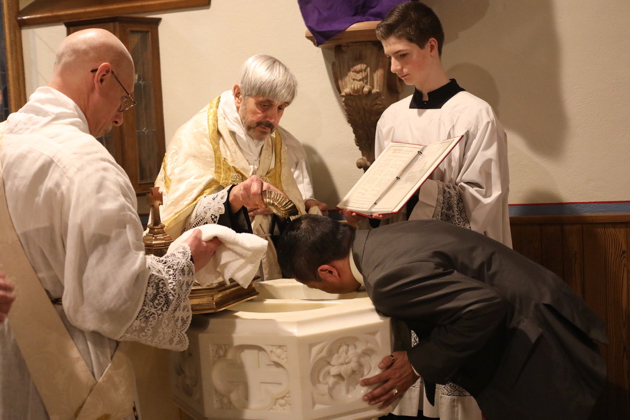 For a second time in this service, the preface dialogue and tone are employed for a major consecration, in this case, of the baptismal water. 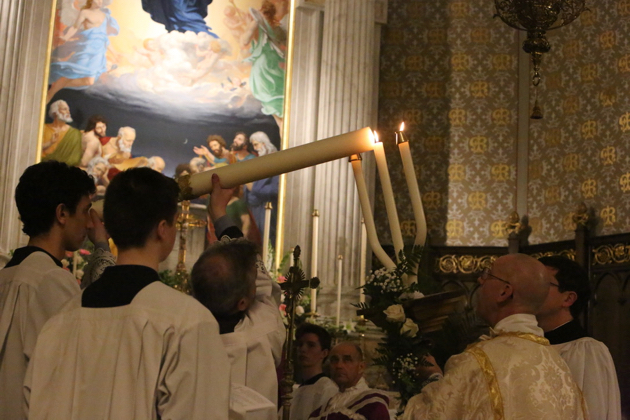 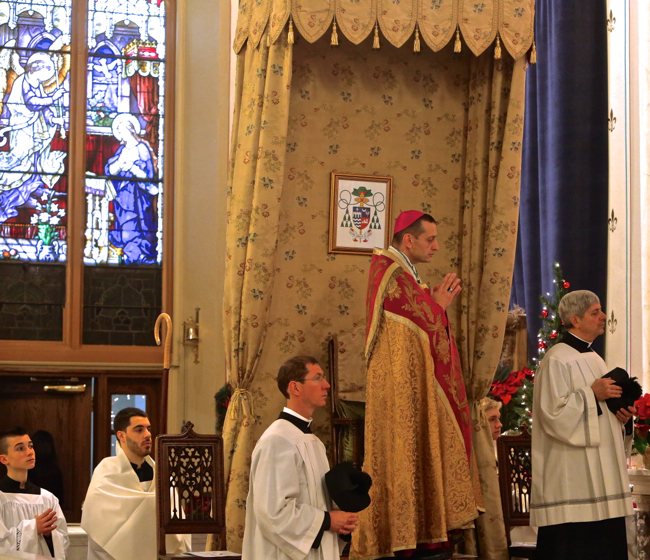 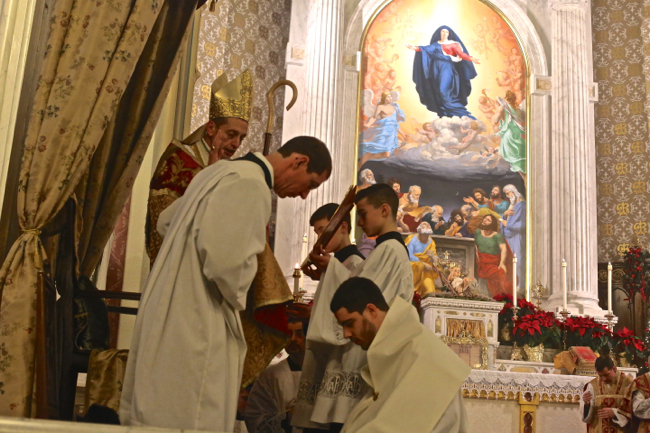 In this photo above, the celebrant plunges the Paschal Candle into the water thrice, deeper and deeper. 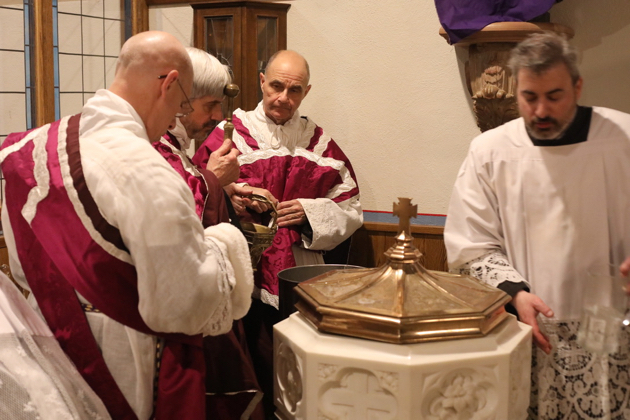 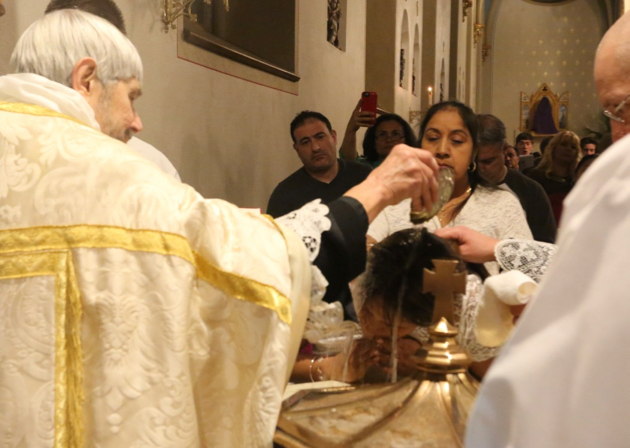 The acolyte removes some of the baptismal water for the aspersory: the celebrant sparges himself and his ministers with the Easter Water. 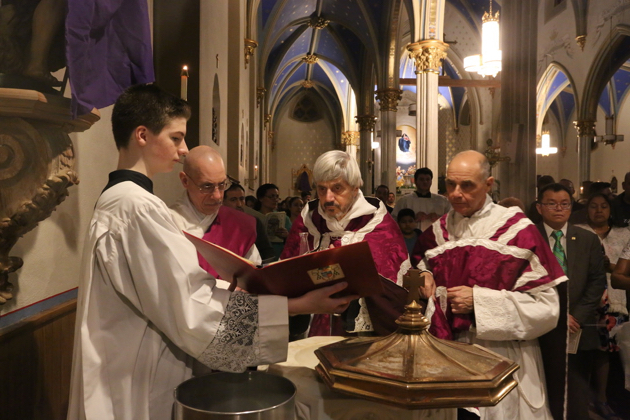 The assisting priest circles the church to sprinkle the faithful with Easter Water. 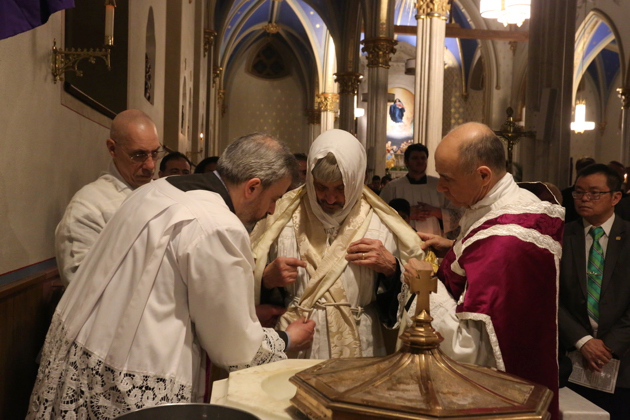 The celebrant changes into white vestments. 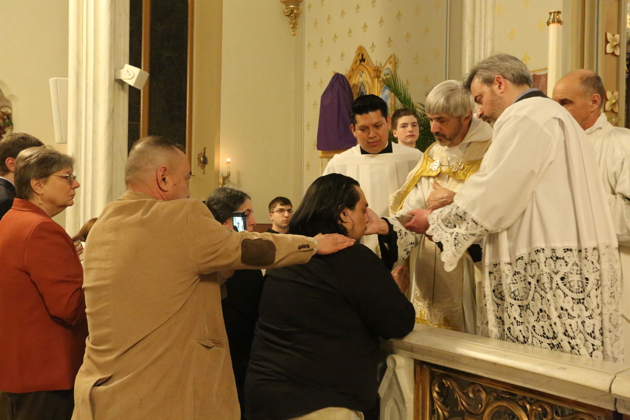 The catechumens are baptized. 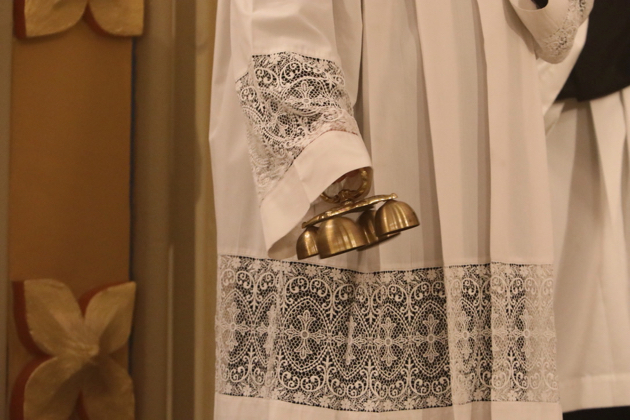 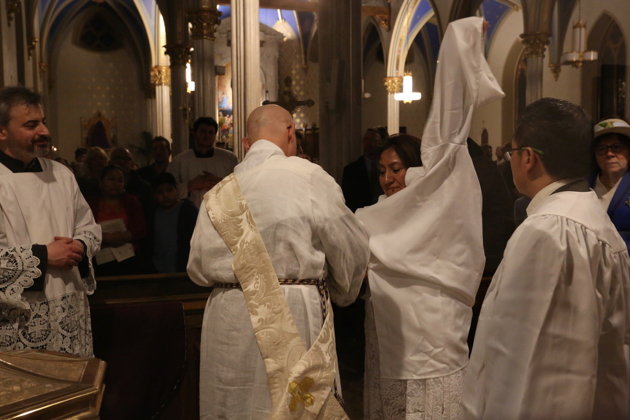 The newly baptized receive their white garments—a symbol of their baptismal innocence—and their baptismal candles, symbolizing the new light of grace which they received. 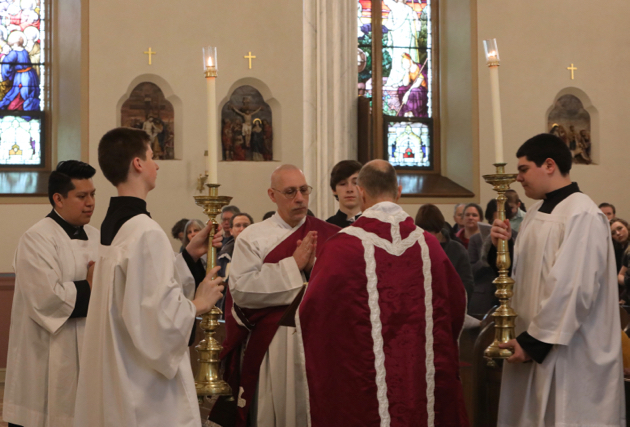 The Confirmations: The procession returns to the sanctuary and the Paschal Candle is returned to its stand. 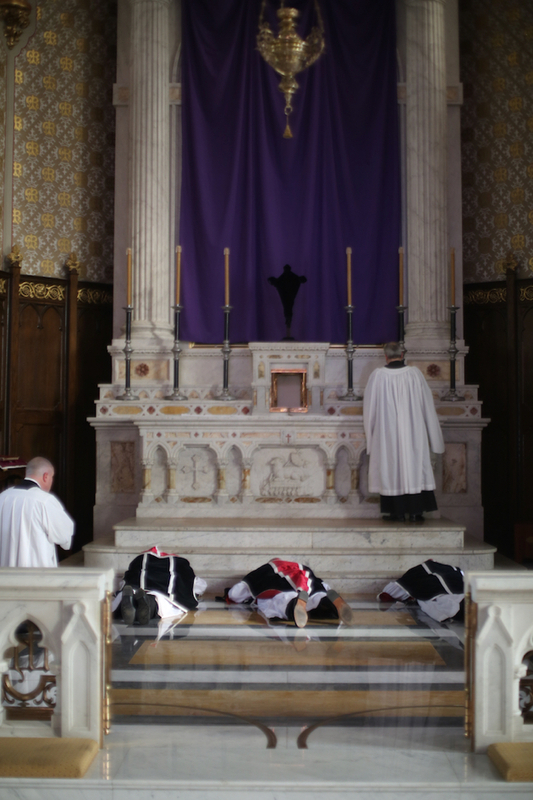 The Confirmation candidates kneel. 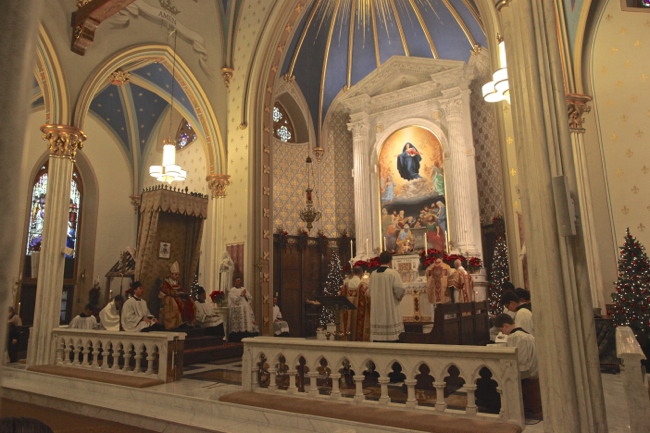 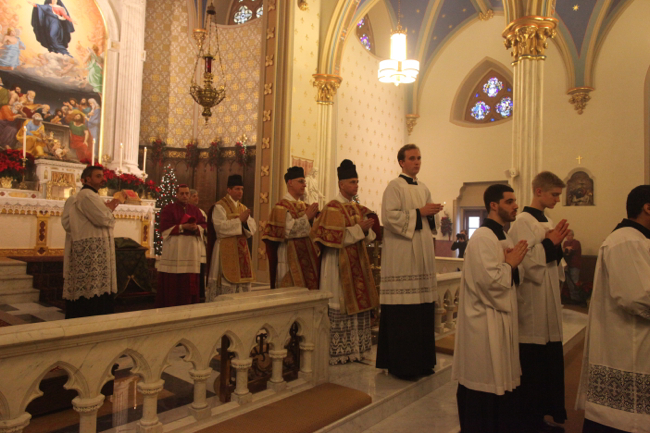 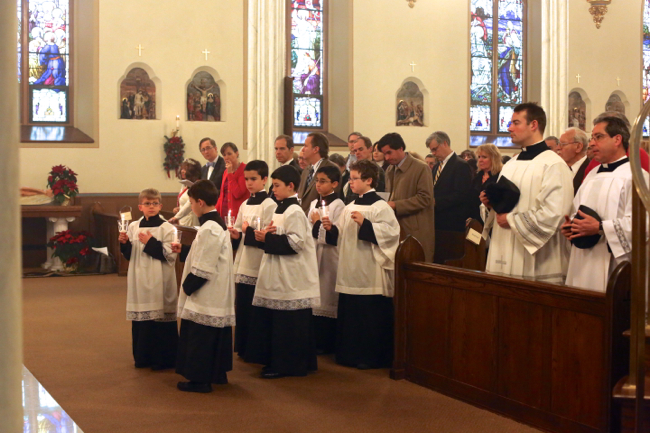 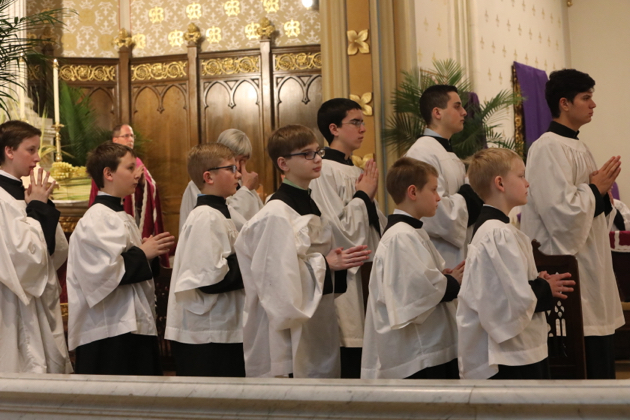 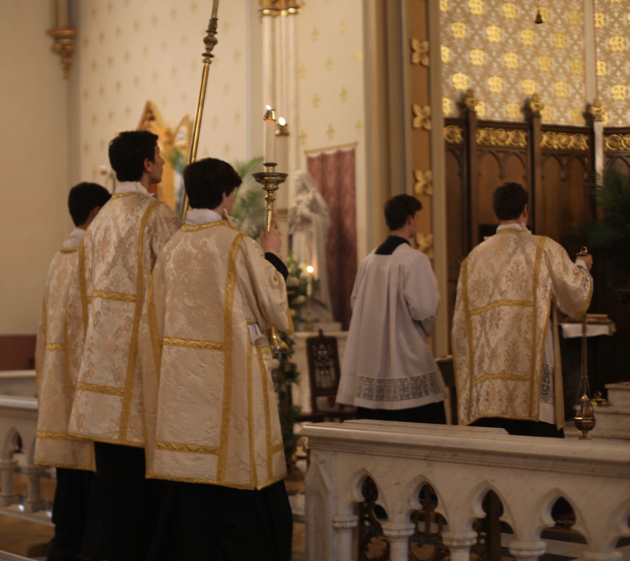 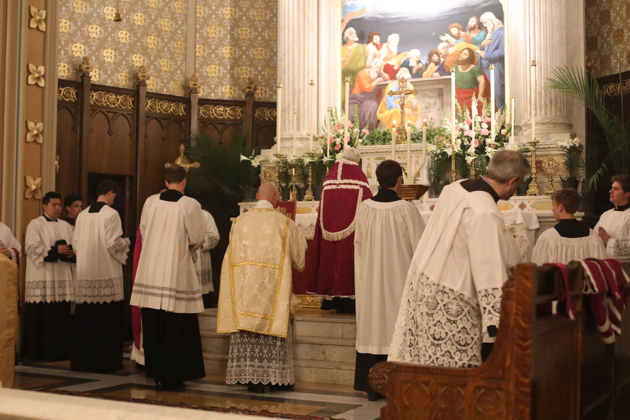 The Litany of the Saints: While the cantors chant the Litany of the Saints, the sacred ministers retreat to the sacristy to change into festive vesture. 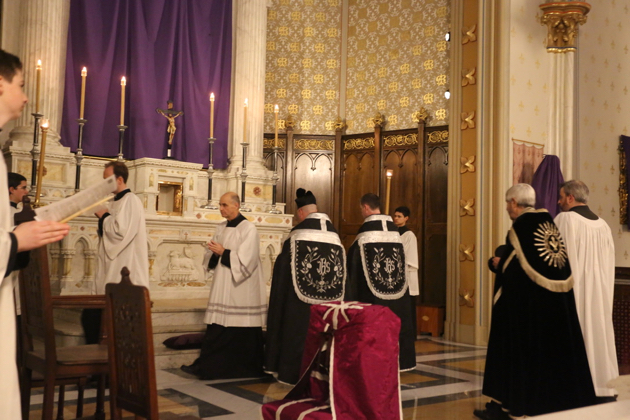 Toward the end of the Litany, the celebrant and ministers return. 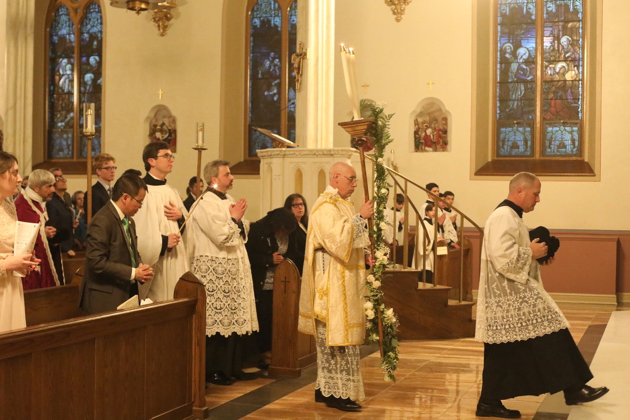 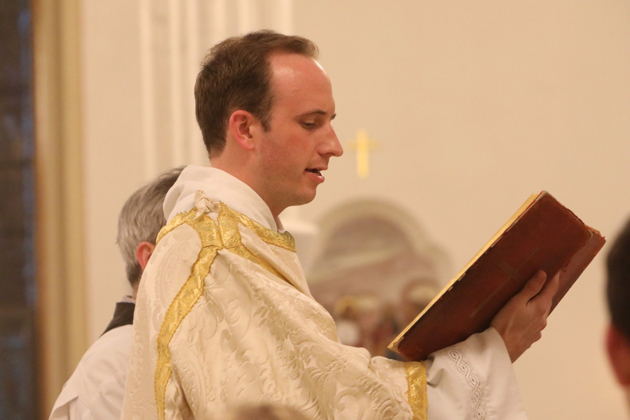 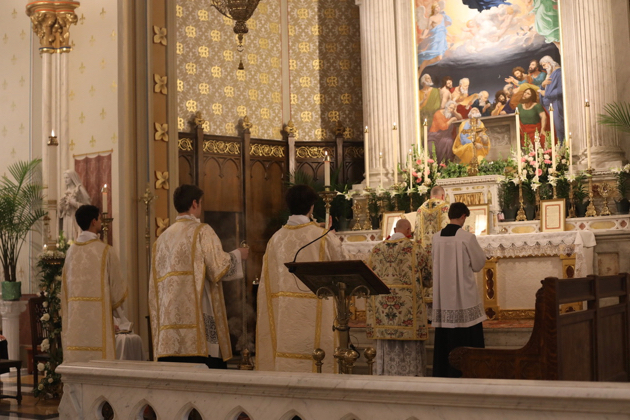 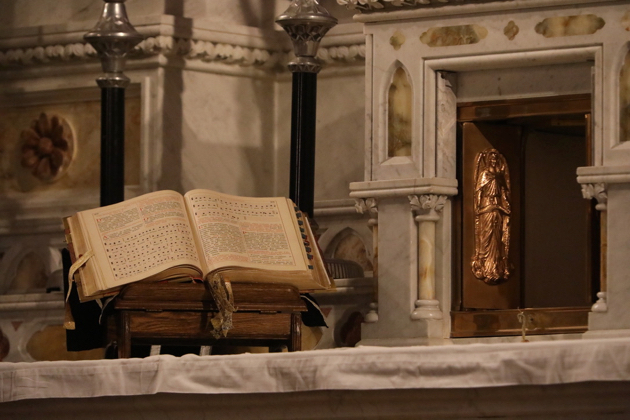 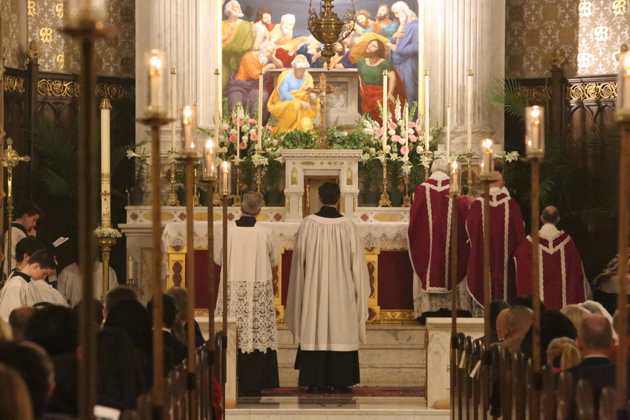 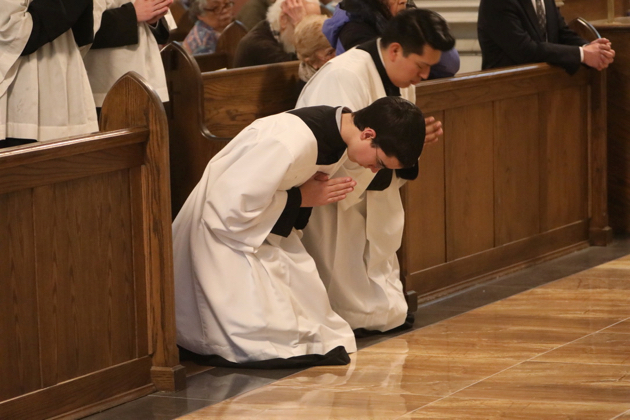 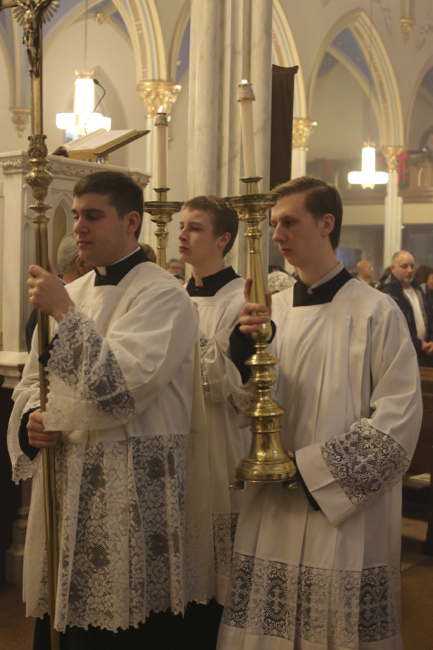 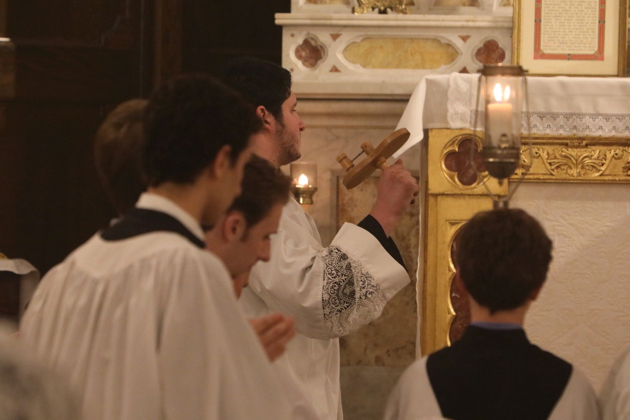 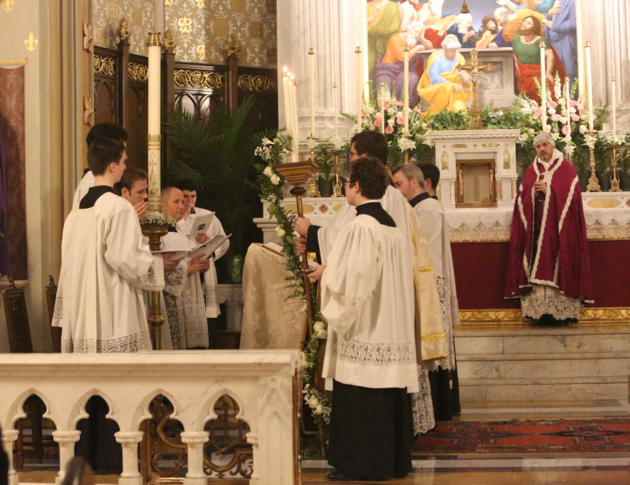 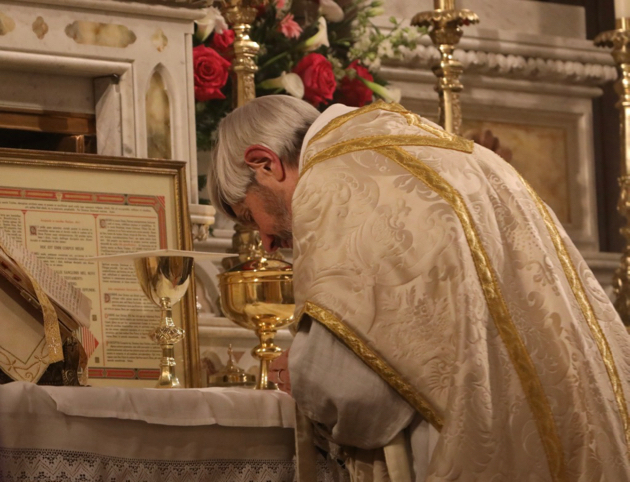 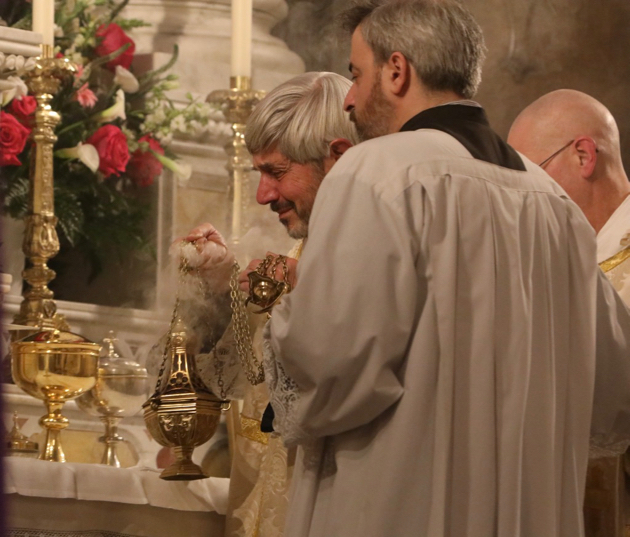 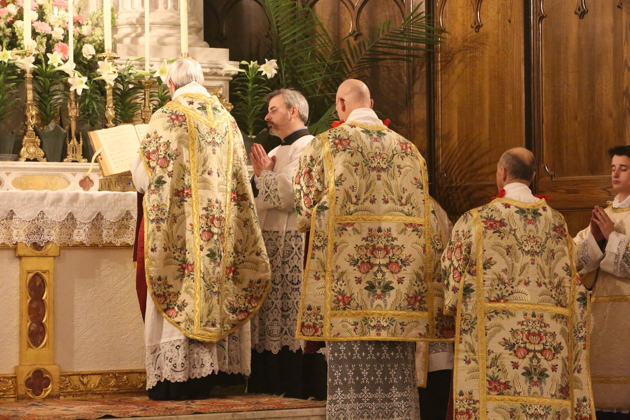 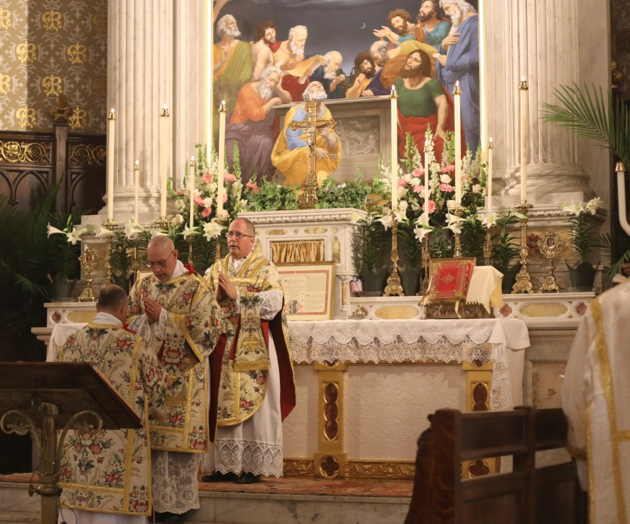 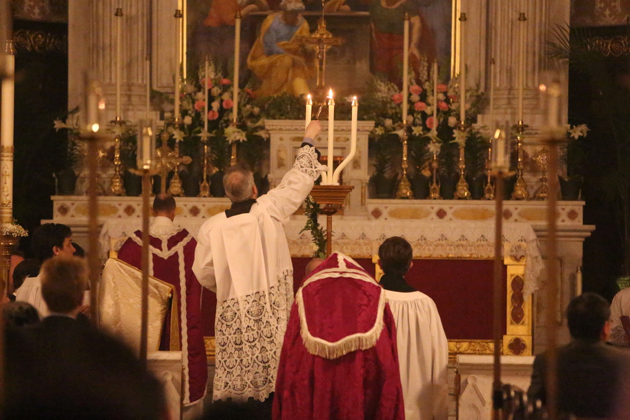 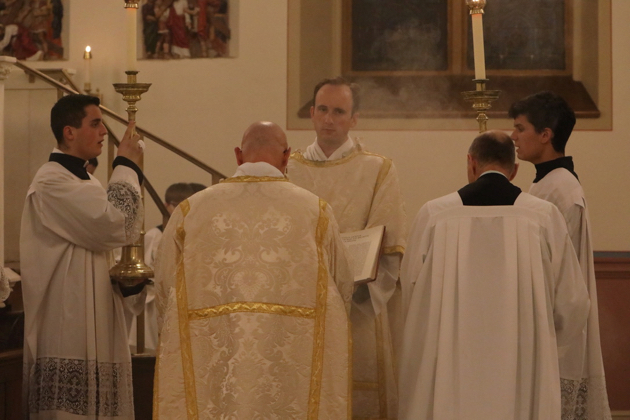 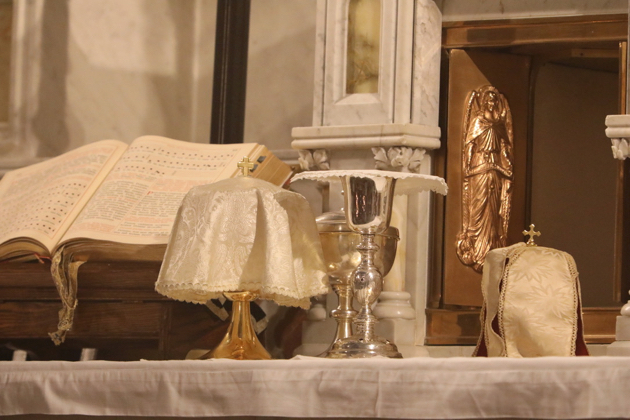 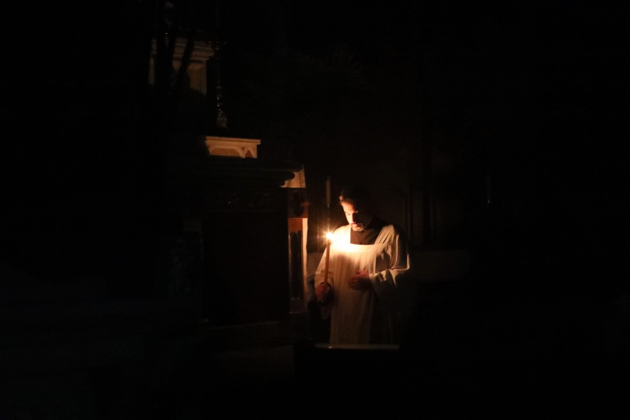 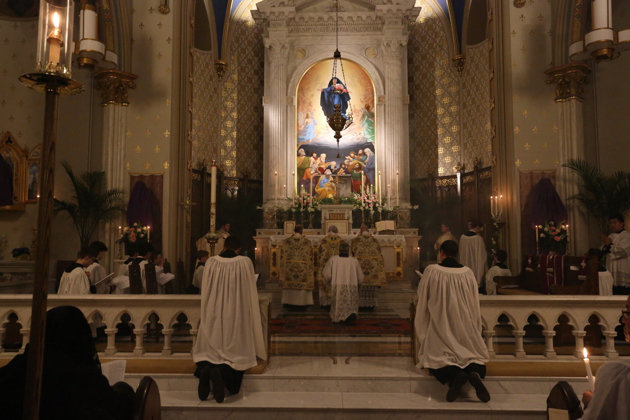 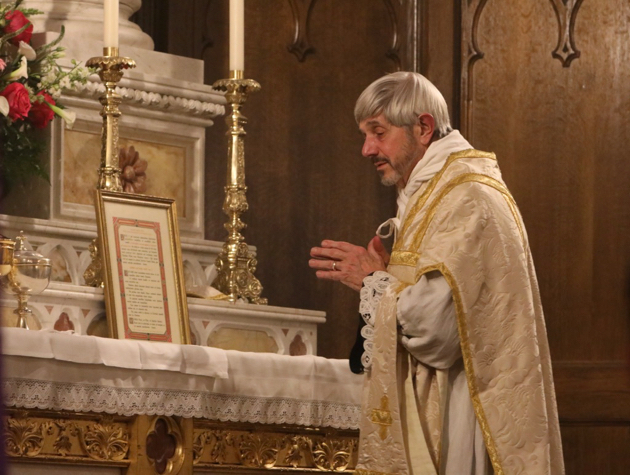 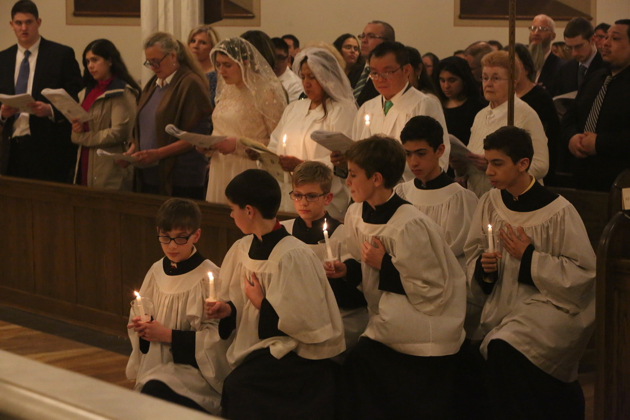 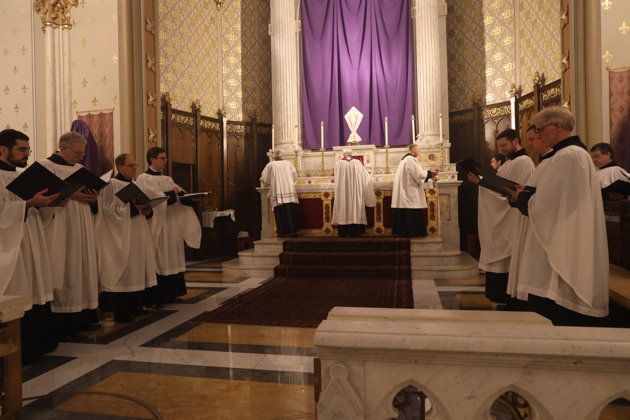 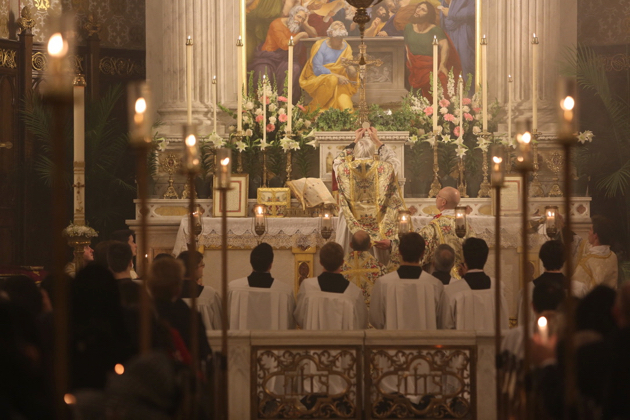 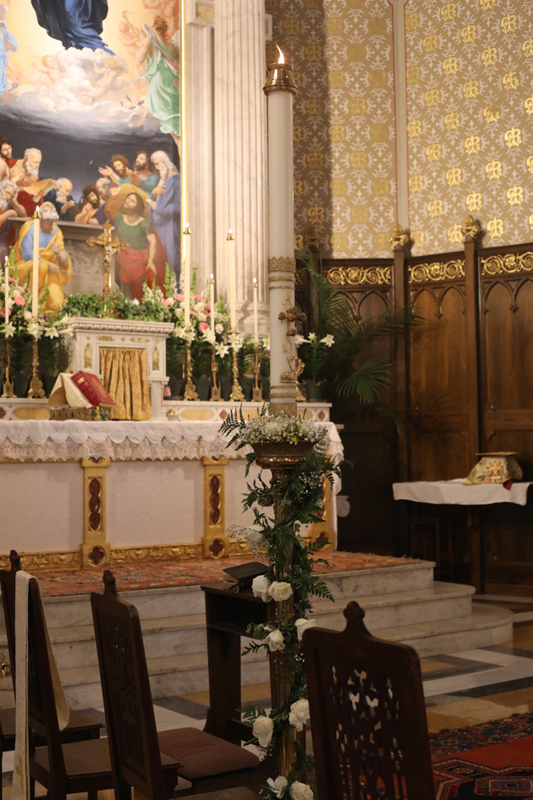 The Mass of the Easter Vigil, due to its extreme antiquity, has no Introit, but instead the Litany is concluded with the solemn recitation of the Kyrie. 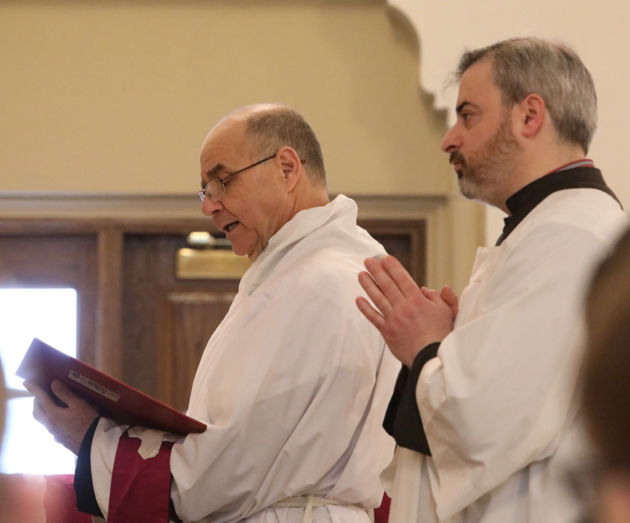 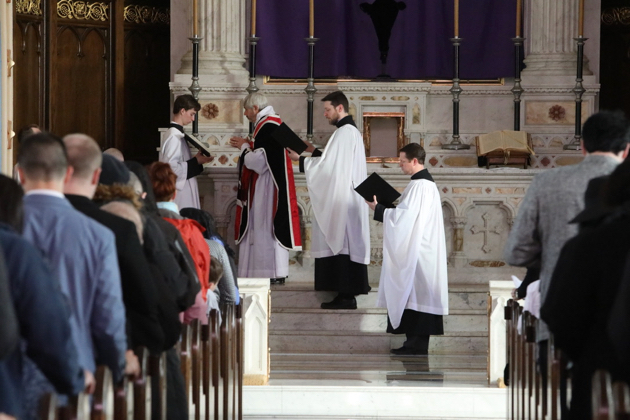 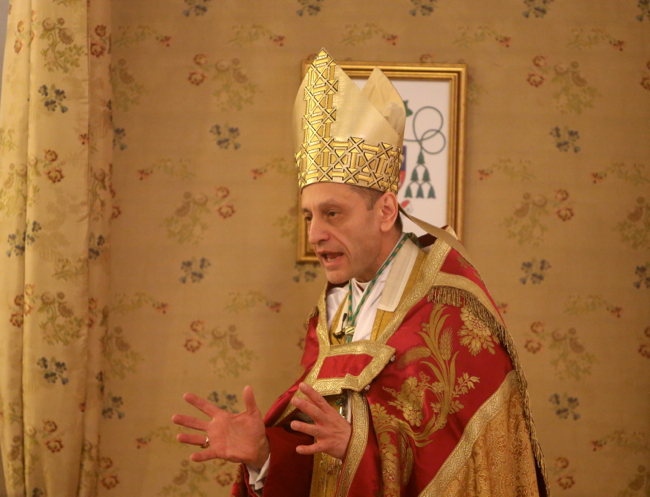 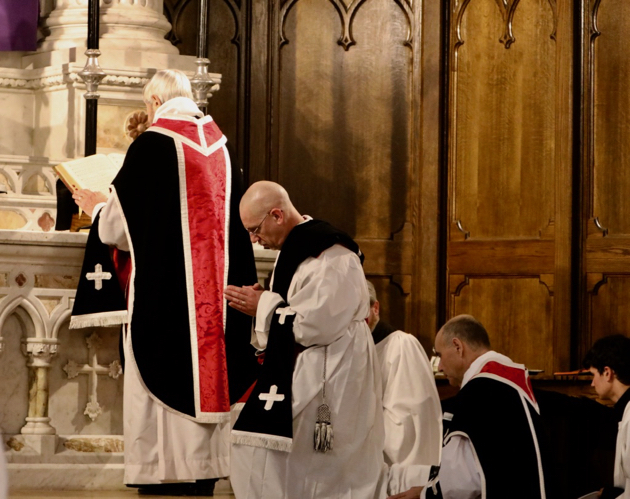 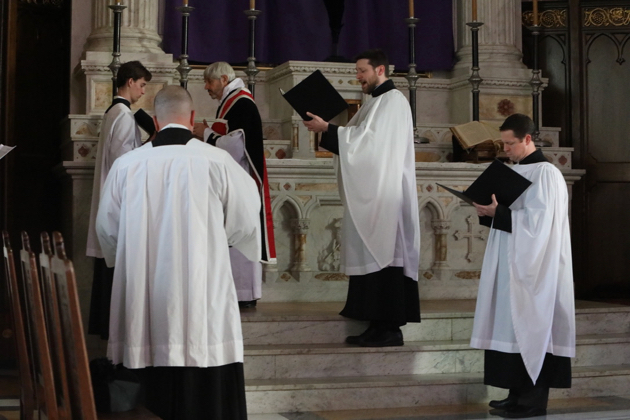 After the sub-deacon intones the Epistle, the celebrant begins a three-fold chanting of the Alleluia which the choir takes up, each time on a higher pitch. 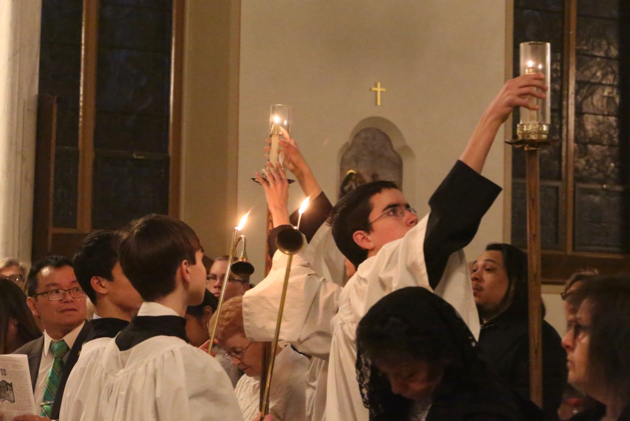 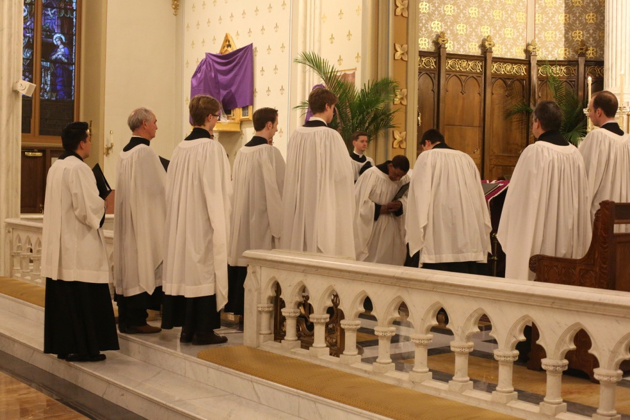 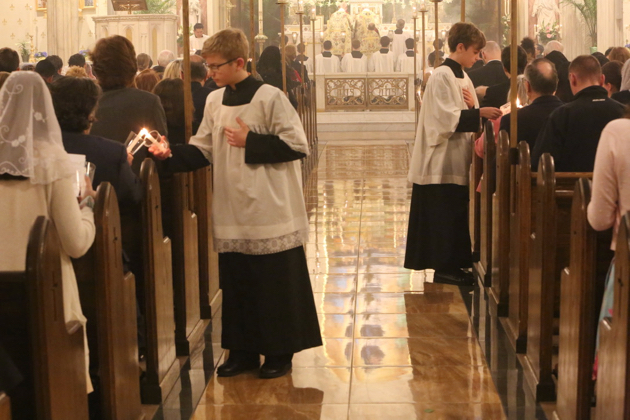 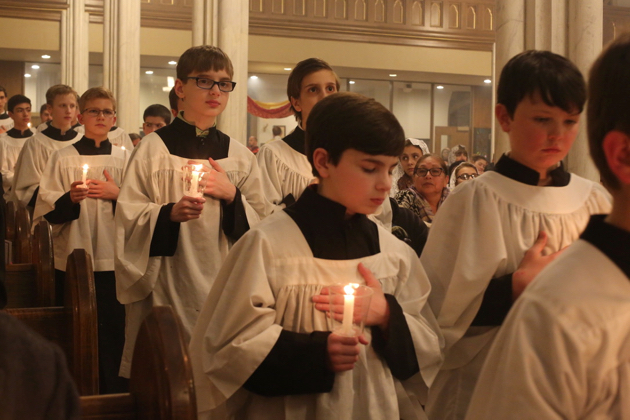 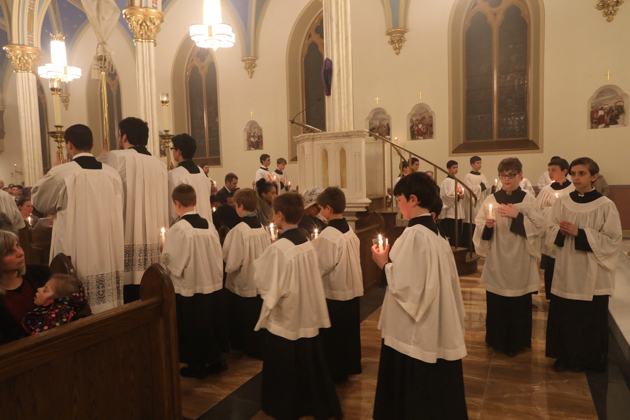 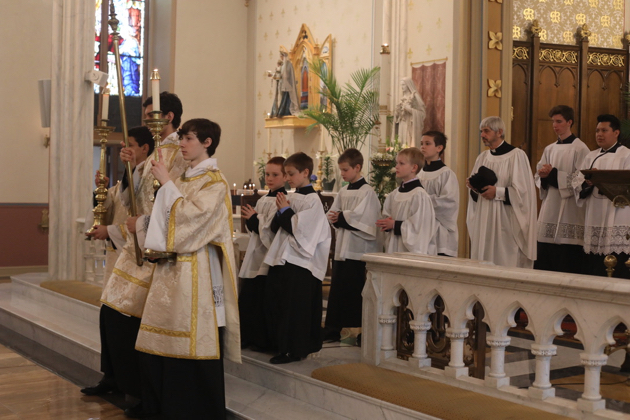 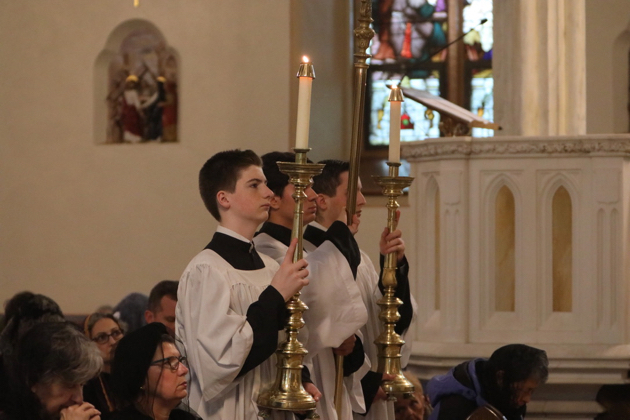 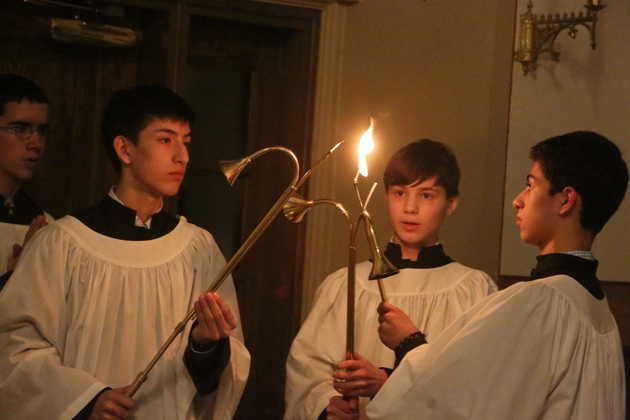 For the singing of the Gospel, acolytes assist in lighting the candles of the faithful from the fire of the Paschal Candle. 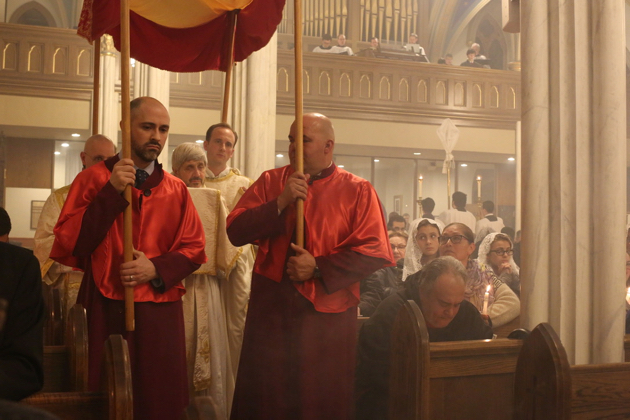 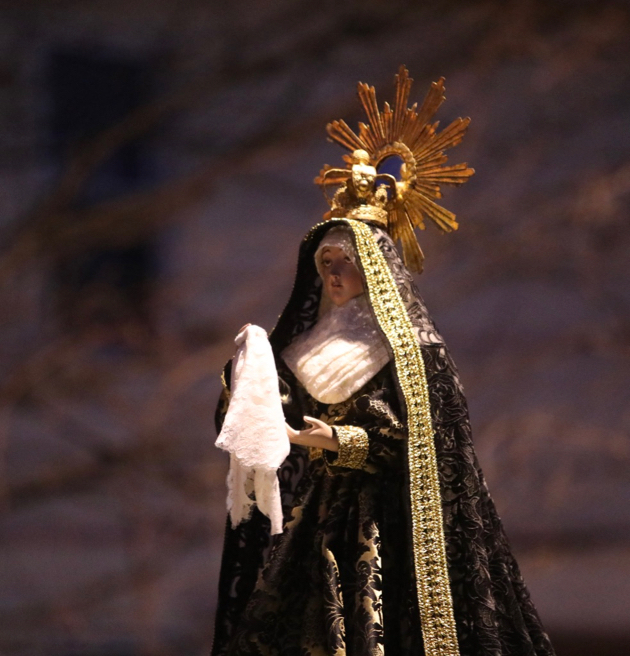 The chanting of the Passion. 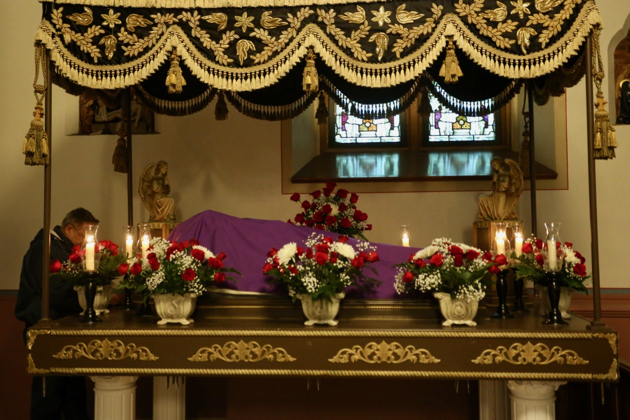 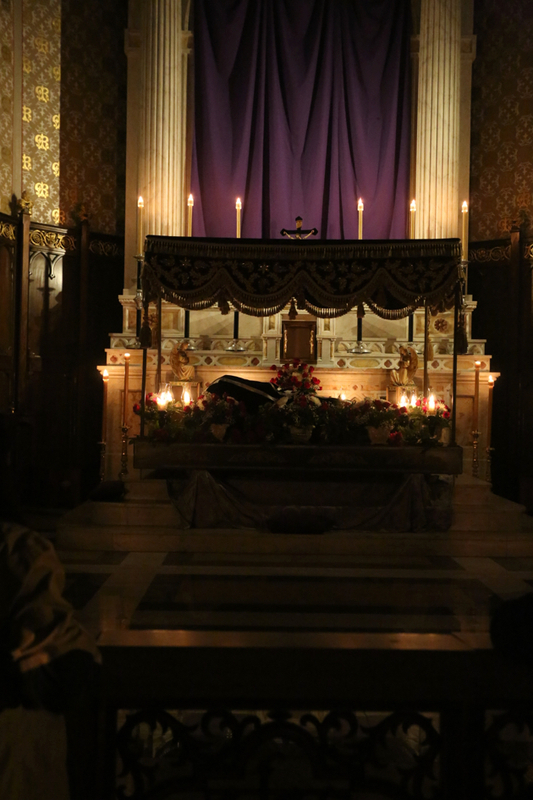 The altar of repose in readiness. 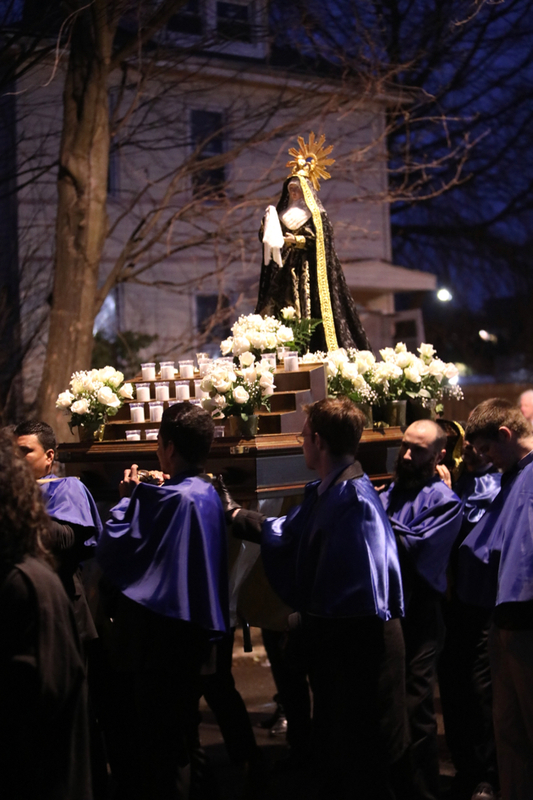 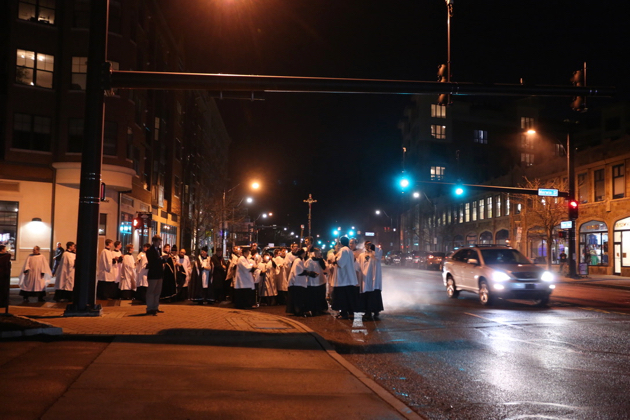 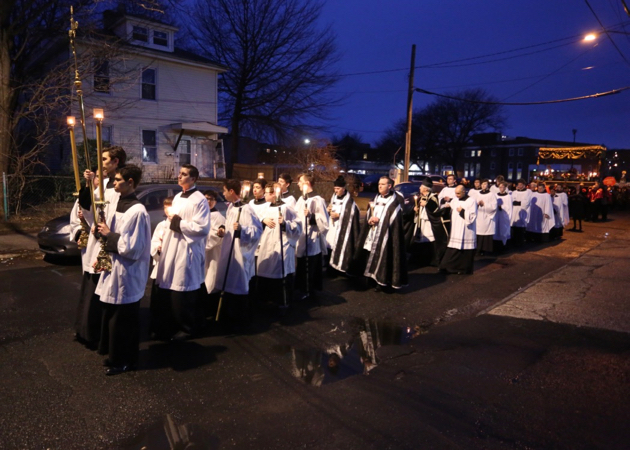 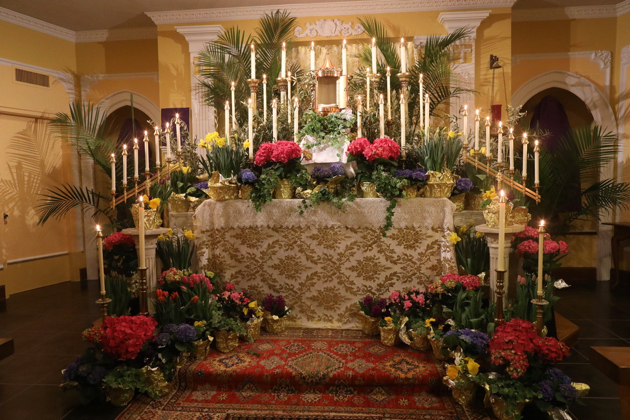 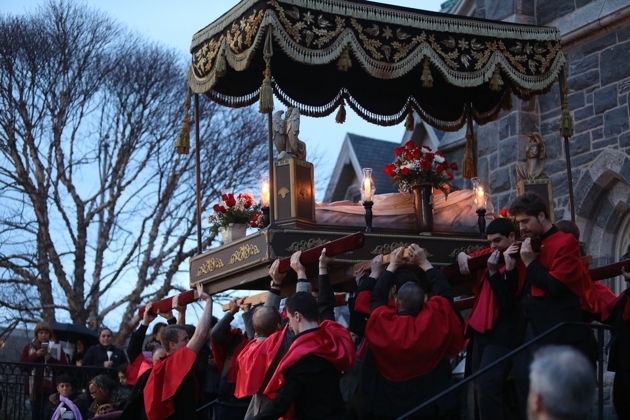 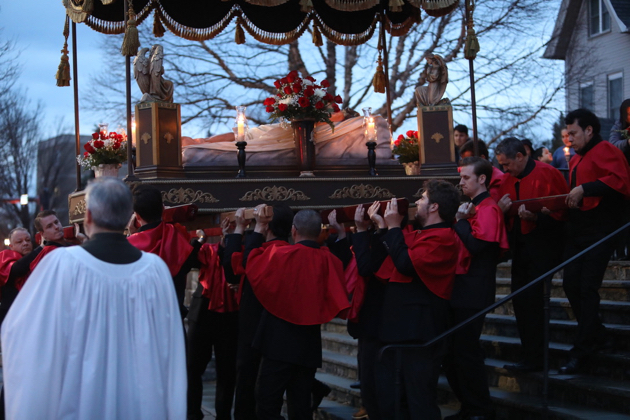 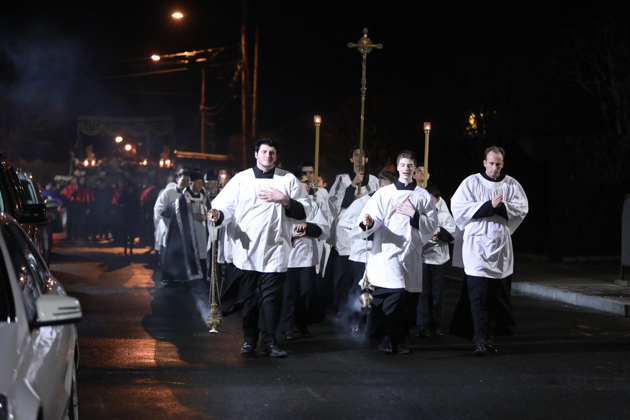 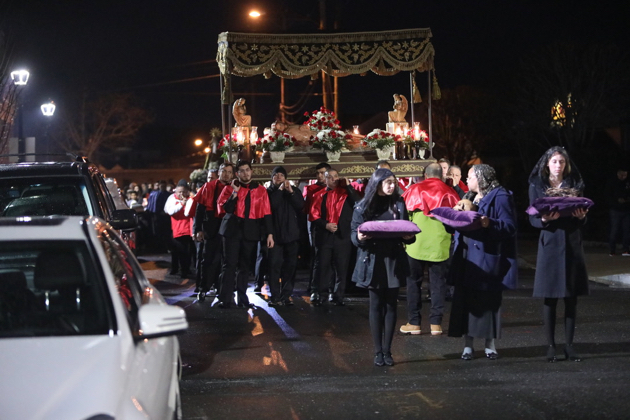 After the Holy Thursday Mass, the procession to the altar of repose at the parish of St. Mary, Norwalk, CT. 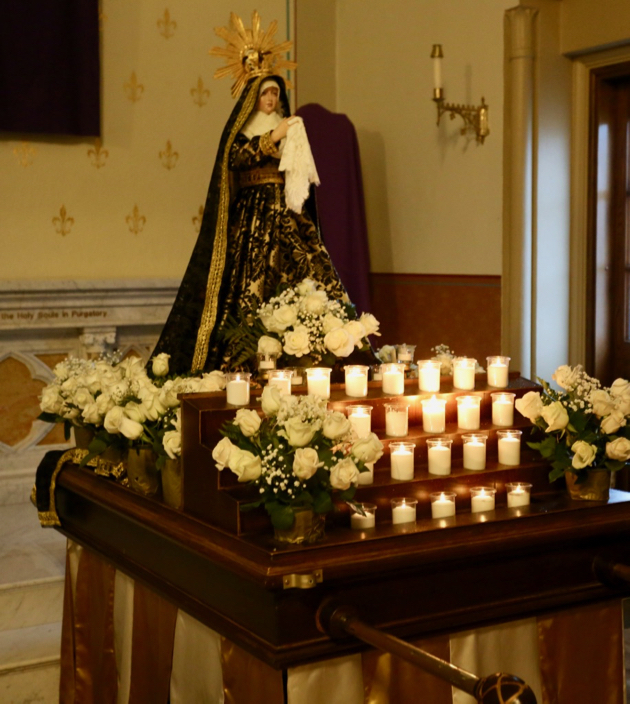 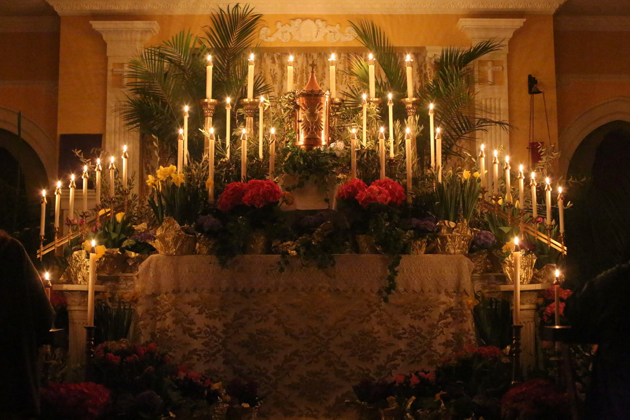 Yesterday evening a very beauiful Office of Tenebrae was sung at St. Mary’s Church, Norwalk, CT. 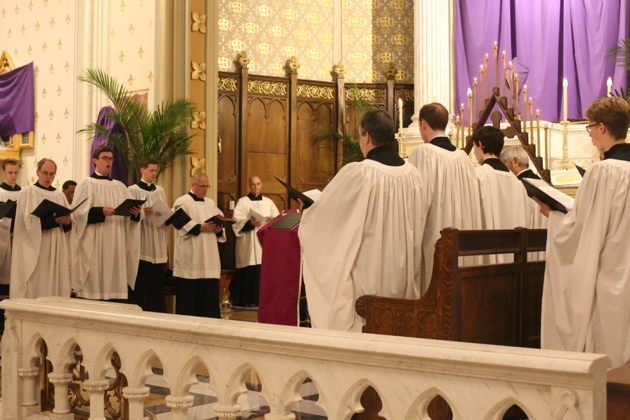 The psalms were chanted in the front by a men’s choir. 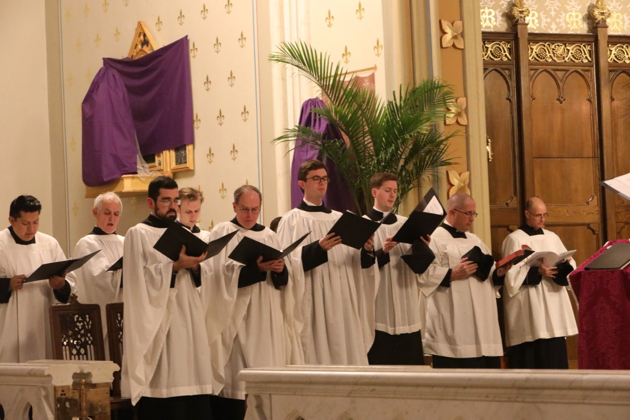 The St. Mary’s Schola Cantorum sang the Lamentations of the Prophet Jeremiah and the responsories in polyphony in the choirloft. 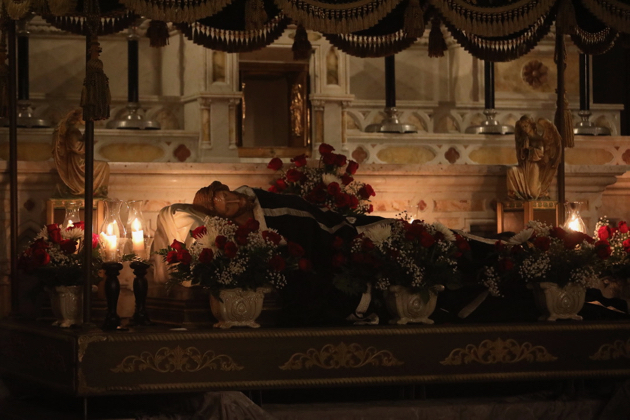 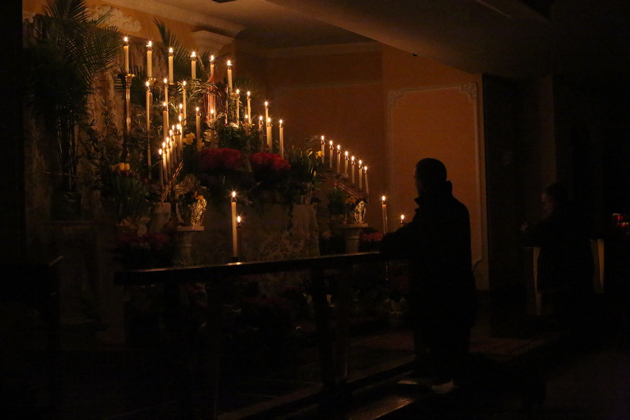 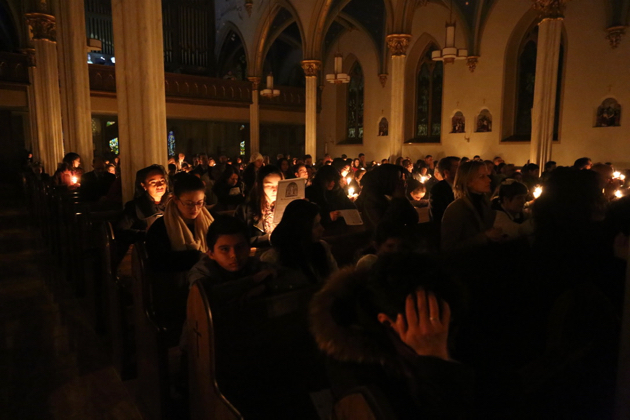 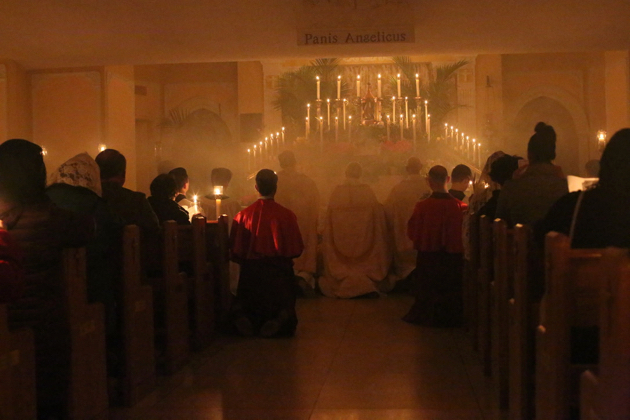 The liturgy ended in complete darkness with a polyphonic setting of the Miserere. 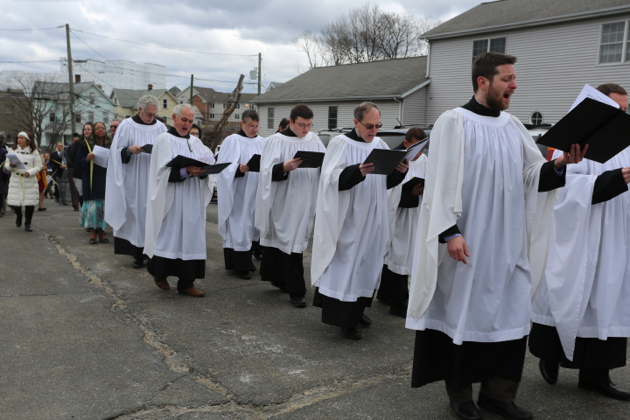 The clergy, choirs and congregation departed in silence. 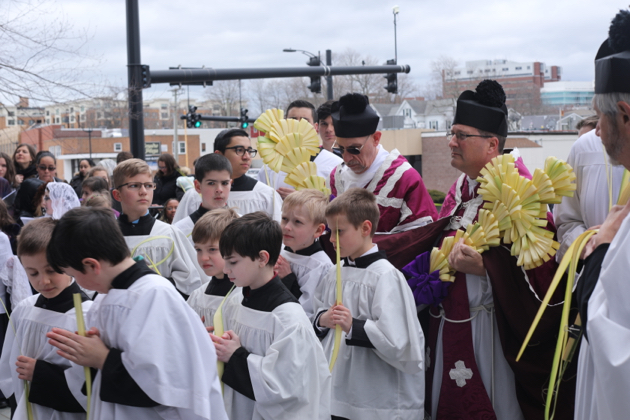 Palm Sunday 2018 at St. Mary’s Church, Norwalk CT. Fr. 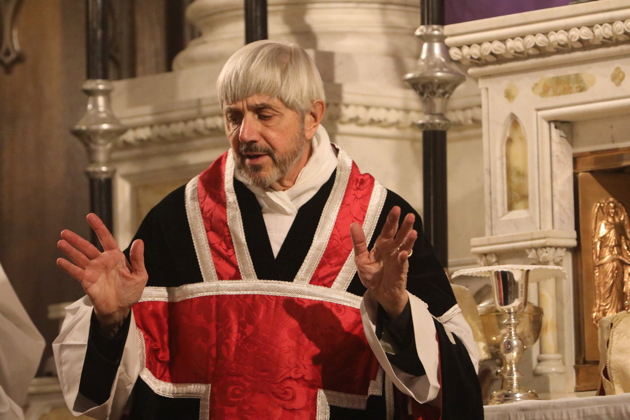 Donald Kloster, celebrant. 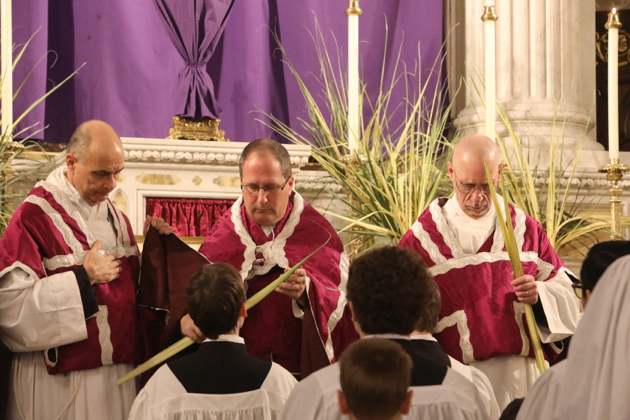 The beginning of the Mass of the Palms. 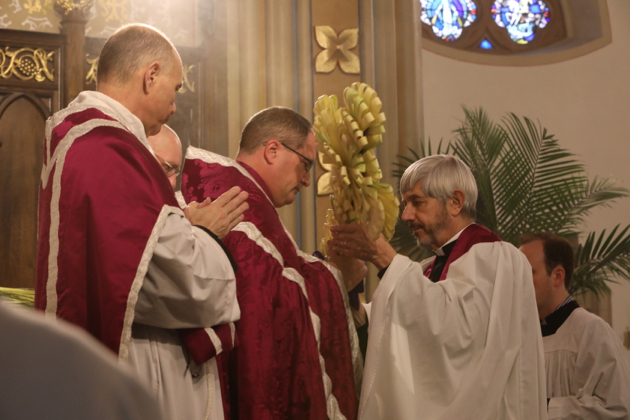 The blessing of the palms. 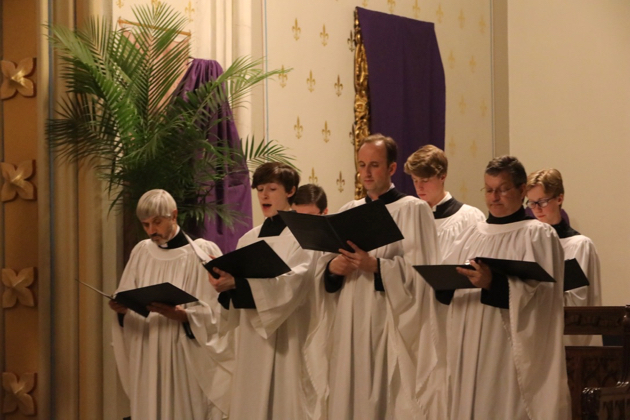 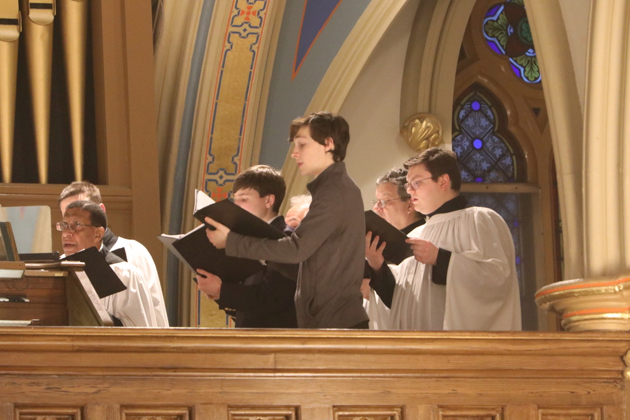 (Above and below) David Hughes, music director of St Mary’s, led the assembled musical forces of the parish:the schola cantorum, combined student scholae, the men’s chant choir and the parish adult choir. 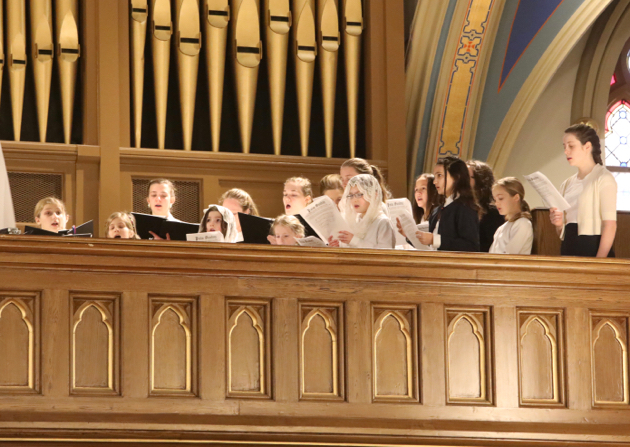 It is a most challenging day of the year in terms of musical complexity! 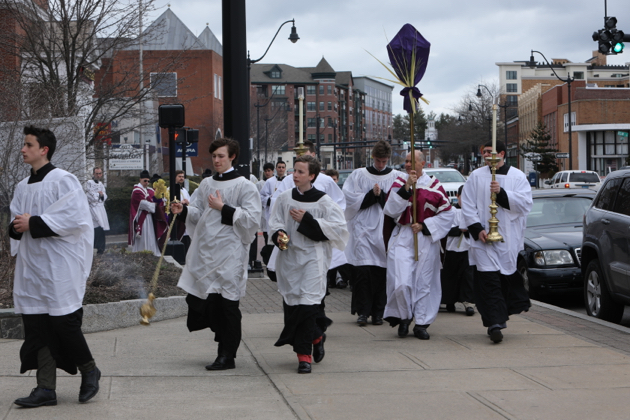 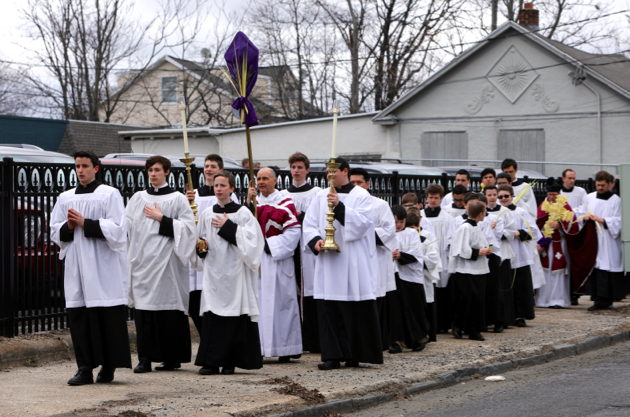 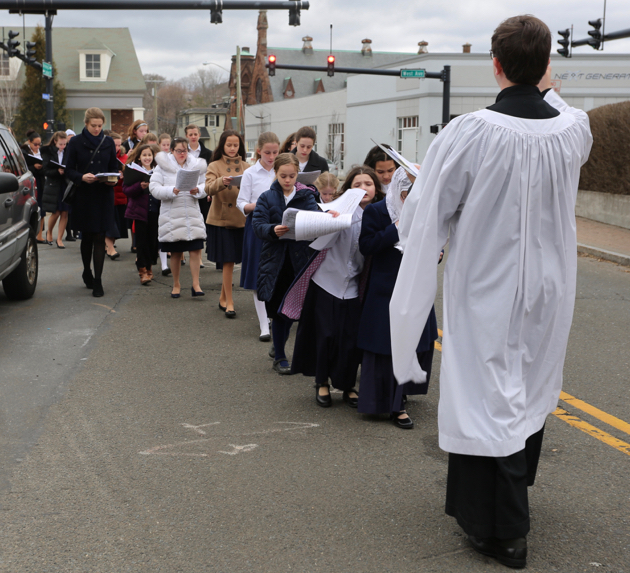 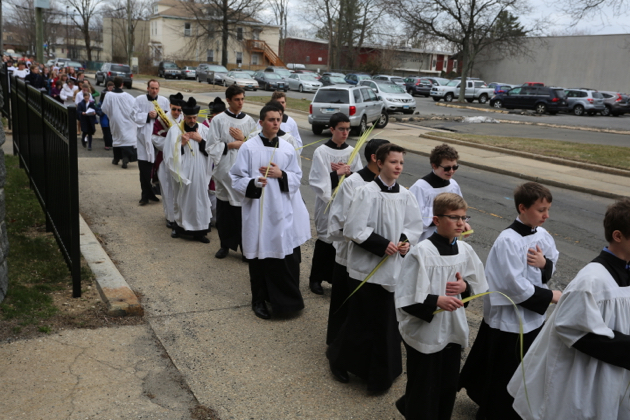 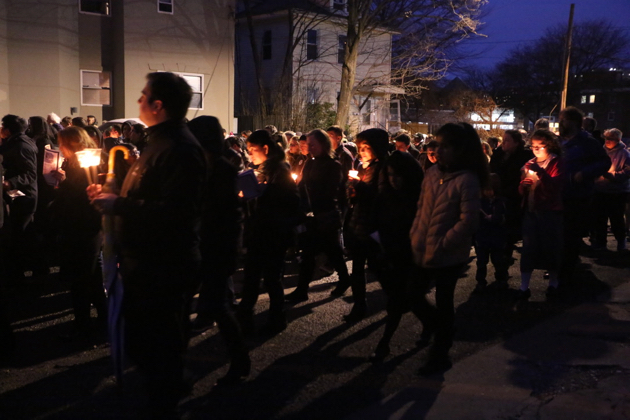 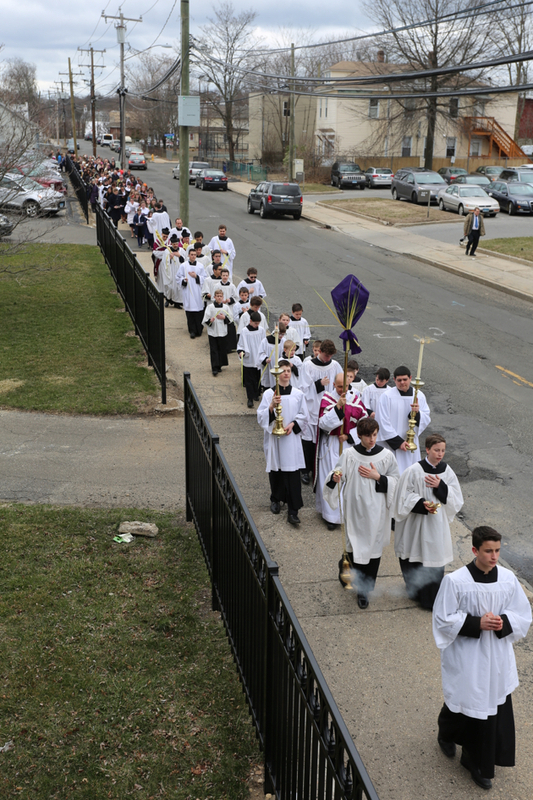 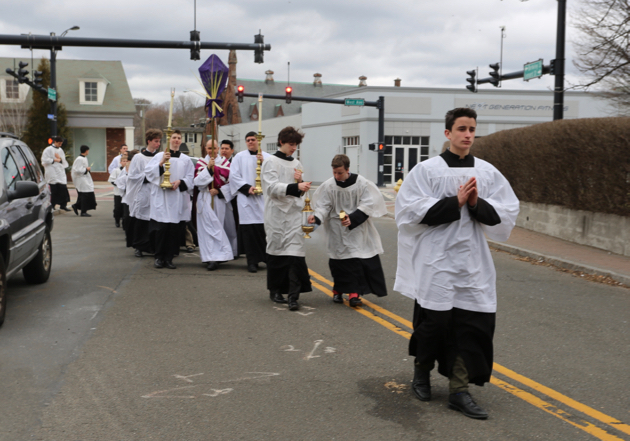 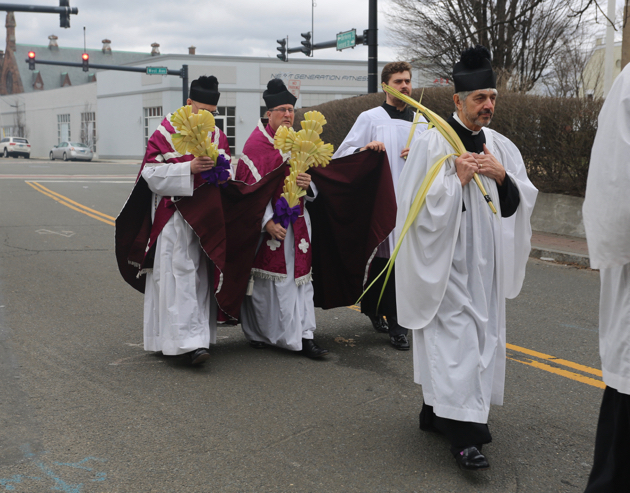 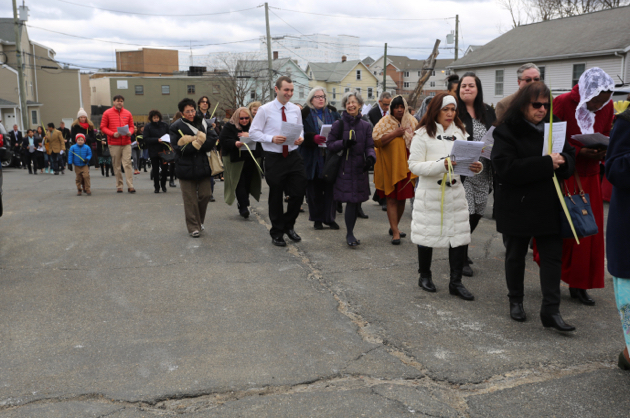 The procession through the streets of Norwalk on a chill early spring day. 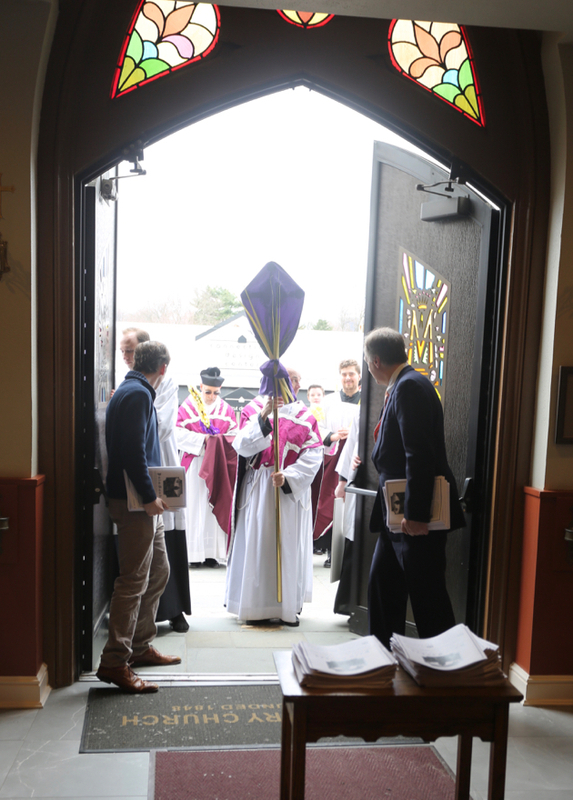 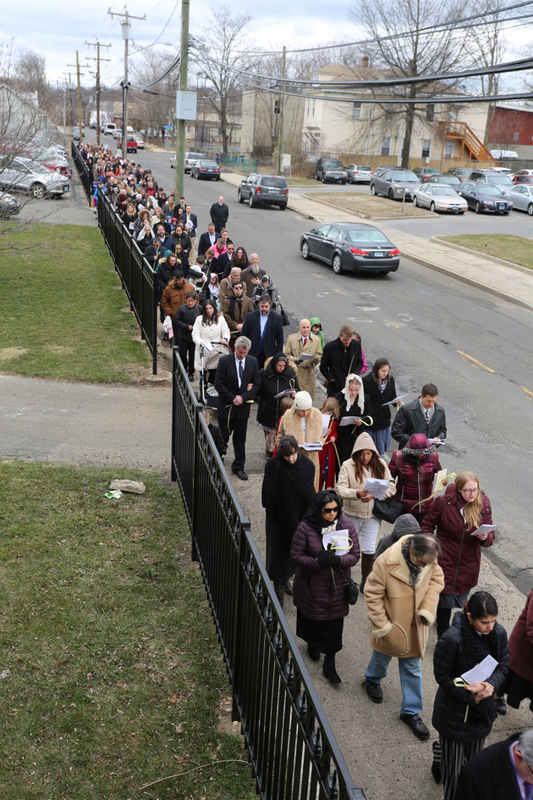 The procession reaches the door of the church. 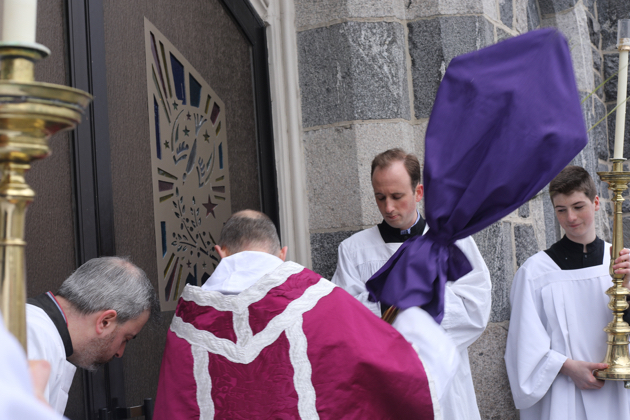 After the final repetition of the refrain, the subdeacon bangs three times on the doors with the foot of the cross. 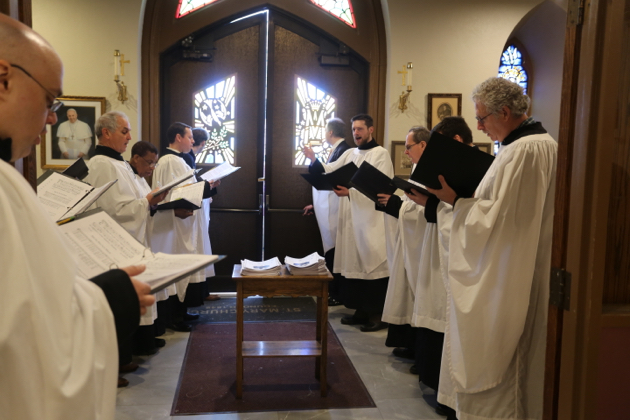 The door is then flung open. 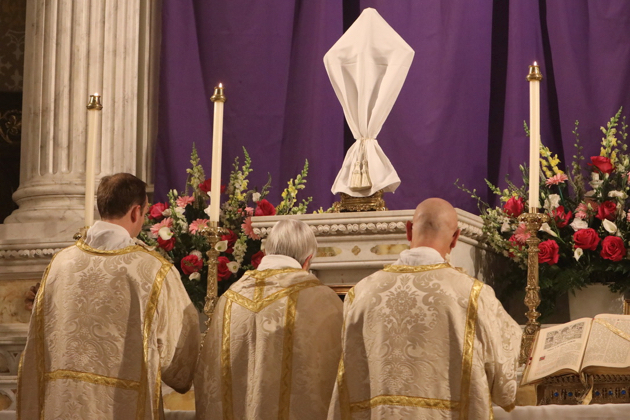 The Mass of the Passion. 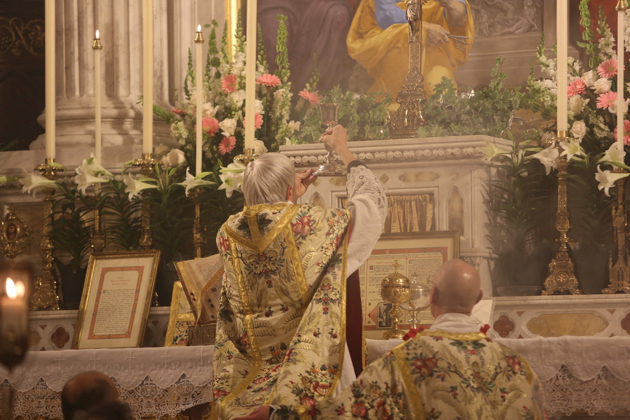 The Passion according to St. Matthew. 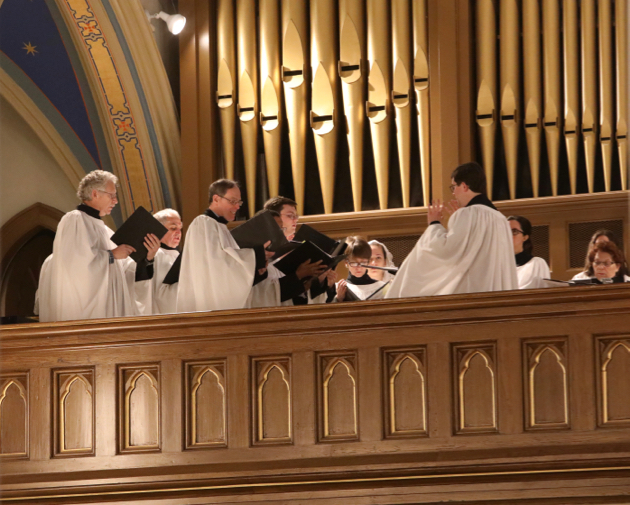 The Passion is sung by three cantors; the choir provides the polyphonic responses of the crowd. 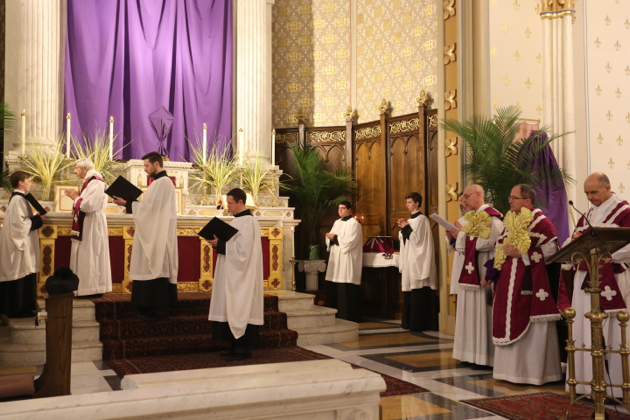 After the cantors of the Passion leave, the conclusion of the Passion is proclaimed by the deacon. 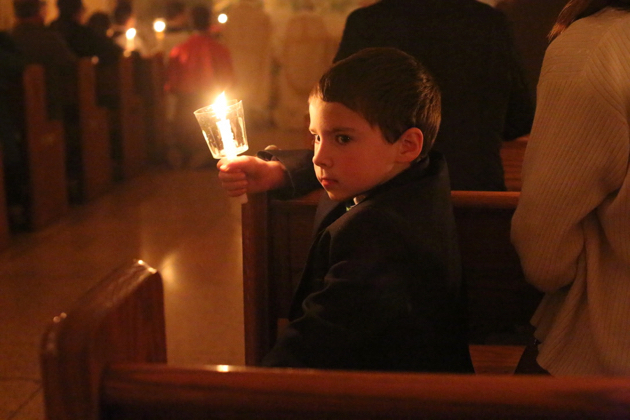 We end on a meditative note. 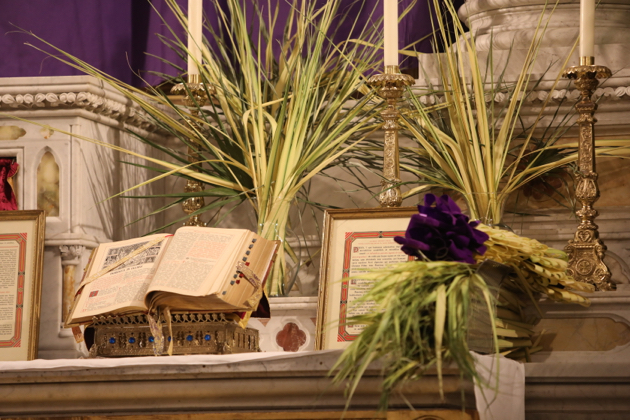 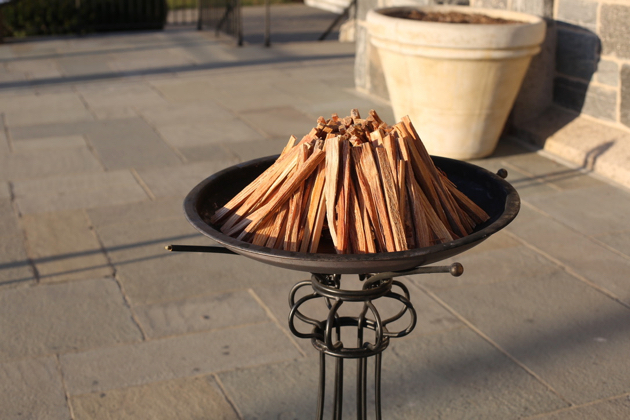 The palm crosses from the day’s ceremonies left at the tomb of Fr. 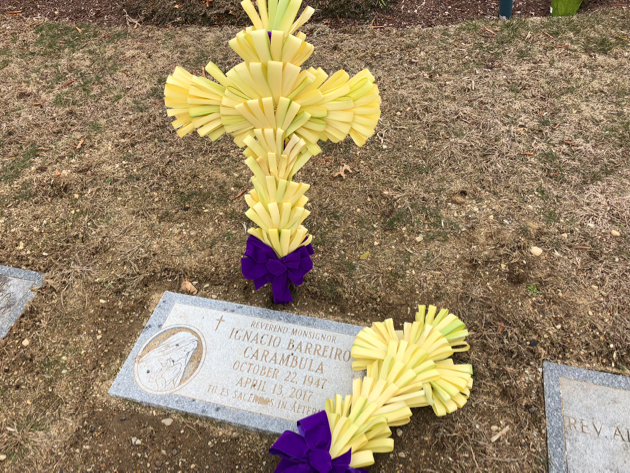 Ignacio Barreiro, curate of the parish, who died almost a year ago on Holy Thursday, April 13, 2017.